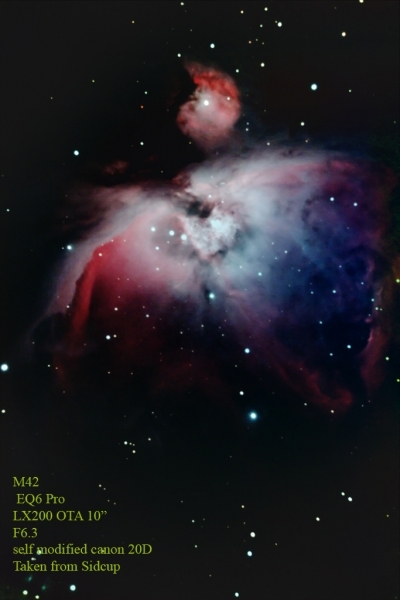 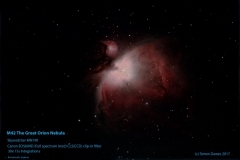 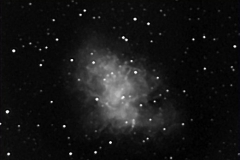 The Messier catalogue is the most famous list of ‘fuzzy’ objects, the list provides a good starting point for amateur astronomers wanting to look at deep sky objects, it contains most types of objects from galaxies to planetary nebula etc. 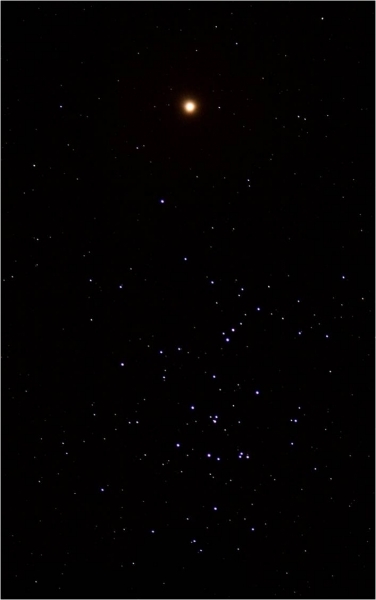 M 29, also known as NGC 6913, is an open cluster of star in the Cygnus constellation. 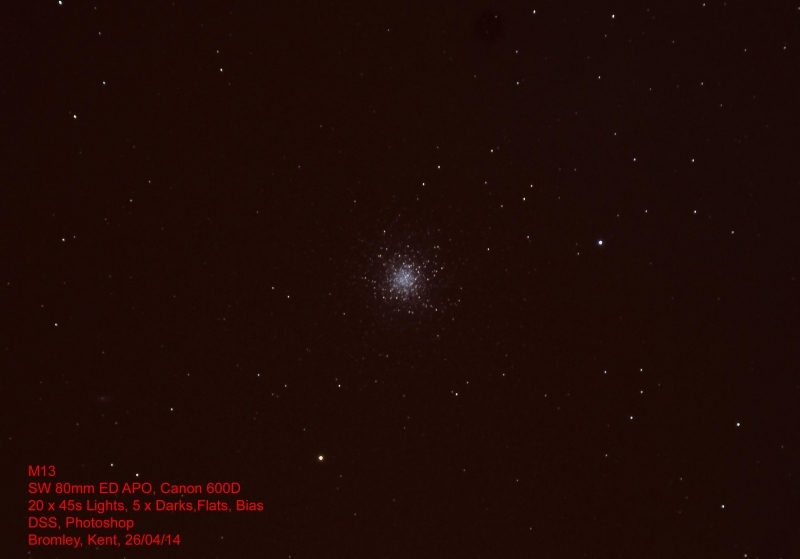 It was discovered by Charles Messier in 1764, and can be seen from Earth by using binoculars. 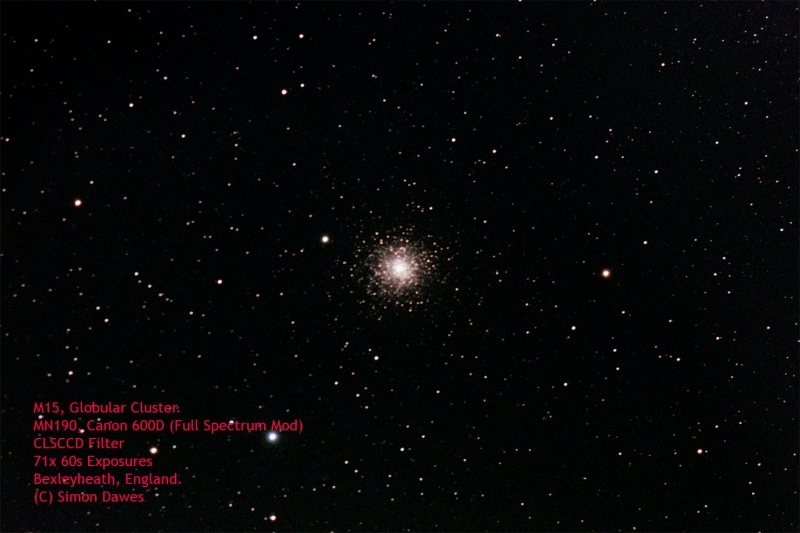 This cluster can be seen in binoculars. 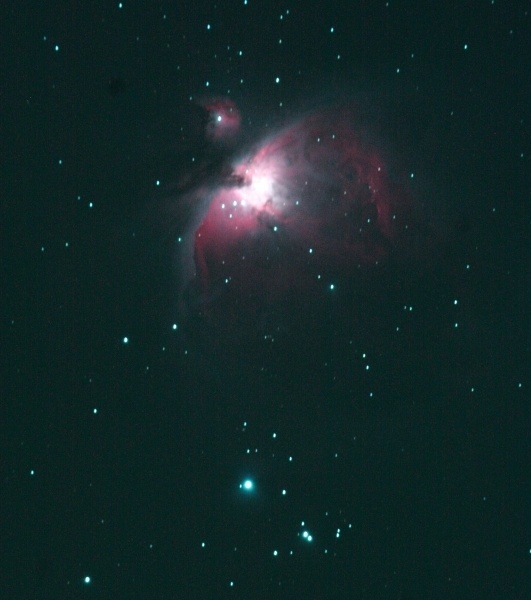 In telescopes, lowest powers are best. 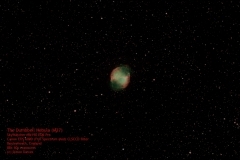 The brightest stars of Messier 29 form a “stubby dipper”, as Mallas says it. 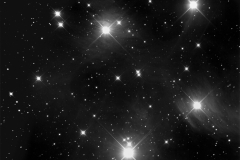 The four brightest stars form a quadrilateral, and another three, a triangle north of them. 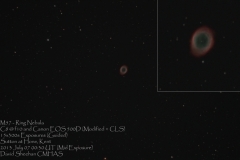 It is often known as the “cooling tower” due to its resemblance to the hyperboloid-shaped structures. 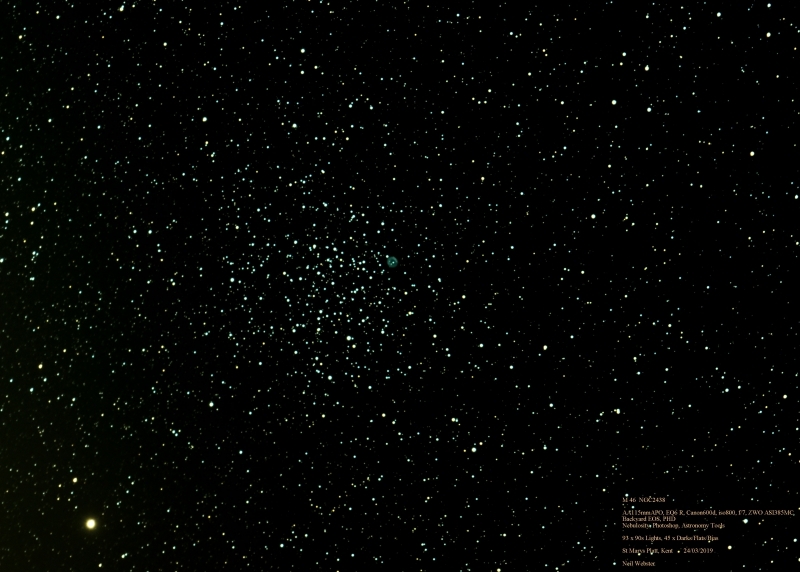 A few fainter stars are around them, but the cluster appears quite isolated, especially in smaller telescopes. 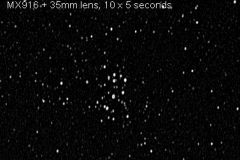 In photographs, a large number of very faint Milky Way background stars shows up. 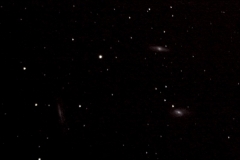 M102 is a galaxy listed in the Messier Catalogue that has not been identified unambiguously. 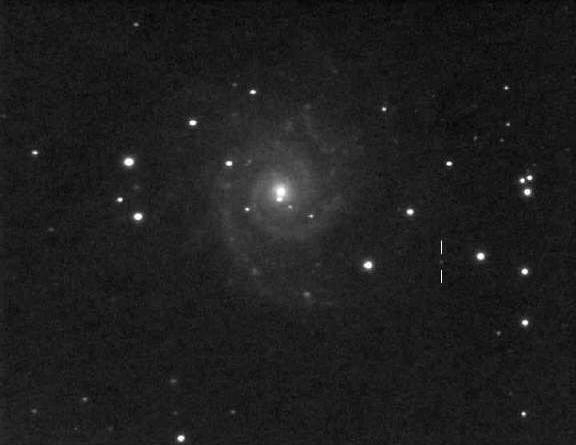 Its original discoverer Pierre Méchain later said that it was a duplicate observation of Messier 101, but more recent historical evidence favours that it is NGC 5866, although other galaxies have been suggested as possible identities. 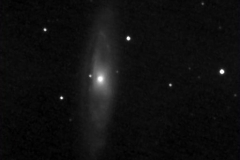 NGC 5866 (one of two galaxies commonly called the Spindle Galaxy) is a lenticular galaxy in the constellation Draco. 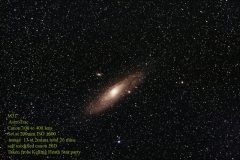 This galaxy appears to closely match both the object description (by Pierre Méchain) in the printed version of the Messier Catalogue of 1781, and the object position given by Charles Messier in hand-written notes on his personal list of the Messier Catalogue. 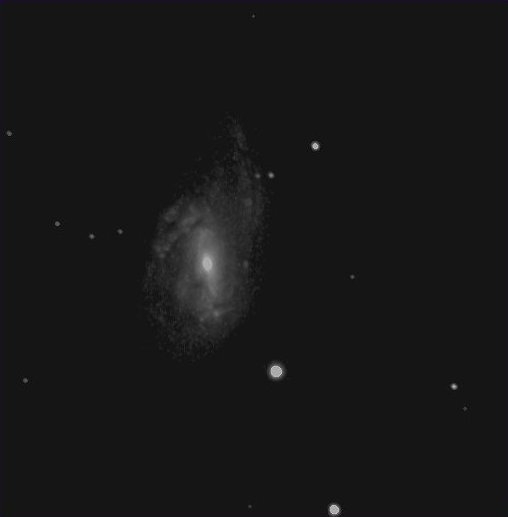 Messier 95, also known as M95 or NGC 3351, is a barred spiral galaxy located about 38 million light-years away in the zodiac constellation Leo. It was discovered by Pierre Méchain in 1781, and catalogued by fellow French astronomer Charles Messier four days later. 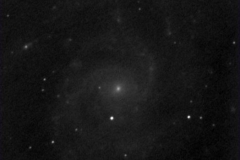 On 16 March 2012, a supernova was discovered in M95. 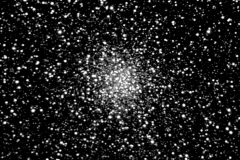 Messier 92 (also known as NGC6341) is a globular cluster of stars in the northern constellation of Hercules. It was discovered by Johann Elert Bode in 1777, then published in the Jahrbuch during 1779. The cluster was independently rediscovered by Charles Messier on March 18, 1781 and added as the 92nd entry in his catalogue. 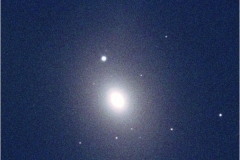 M92 is at a distance of about 26,700 light-years away from Earth. 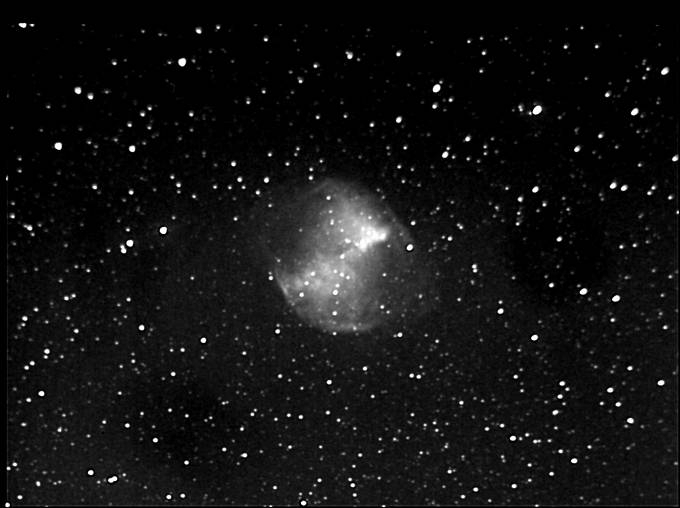 The Little Dumbbell Nebula, also known as Messier 76, NGC 650/651, the Barbell Nebula, or the Cork Nebula, is a planetary nebula in the constellation Perseus. 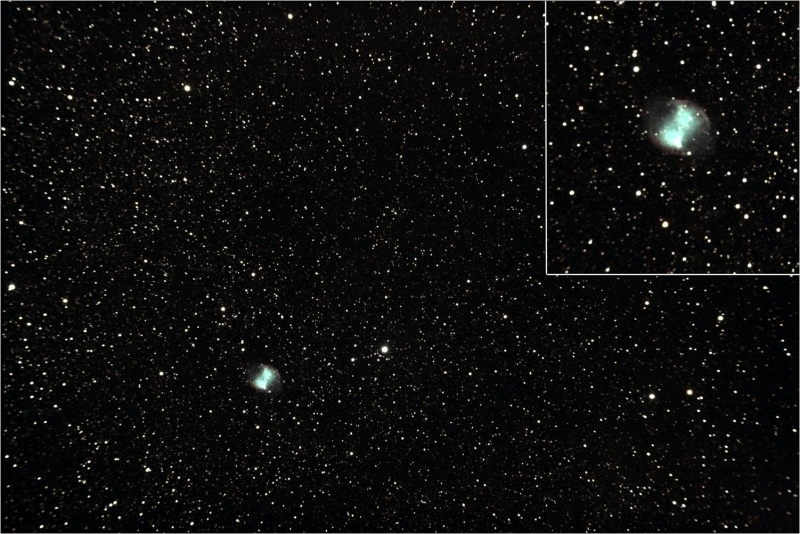 It was discovered by Pierre Méchain in 1780 and included in Charles Messier’s catalogue of comet-like objects as number 76. 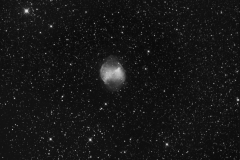 It was first recognised as a planetary nebula in 1918 by the astronomer Heber Doust Curtis. 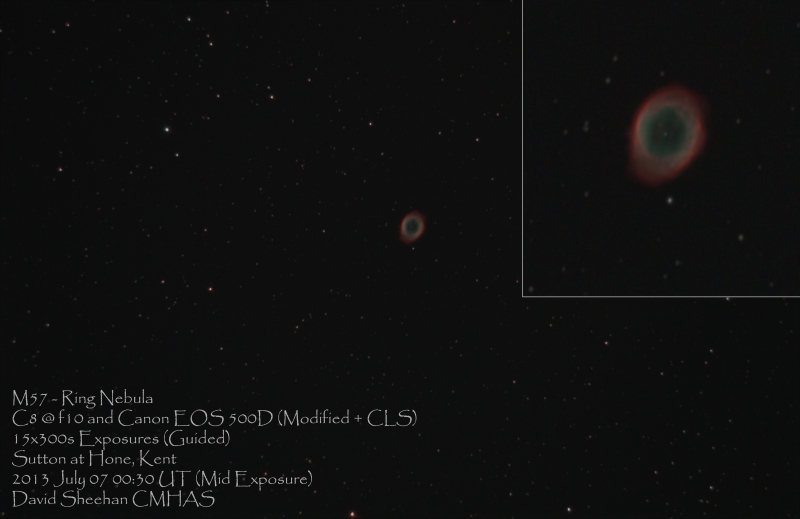 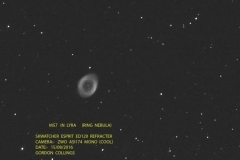 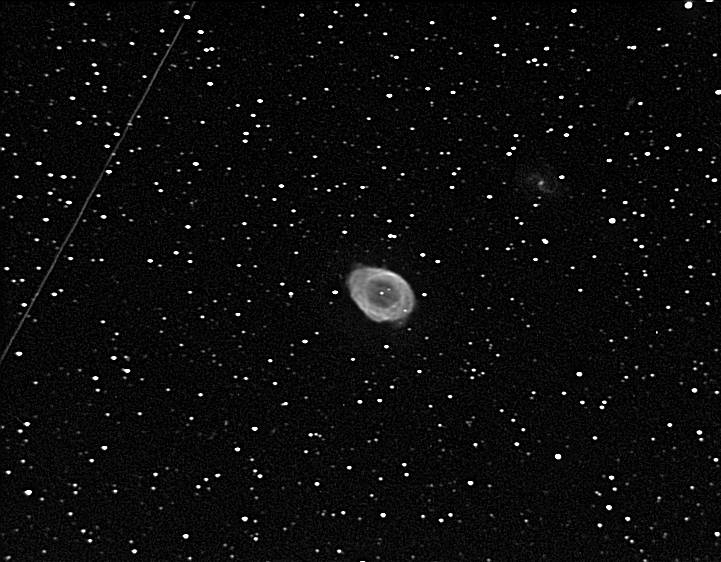 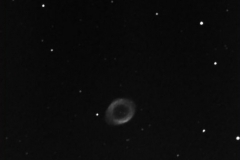 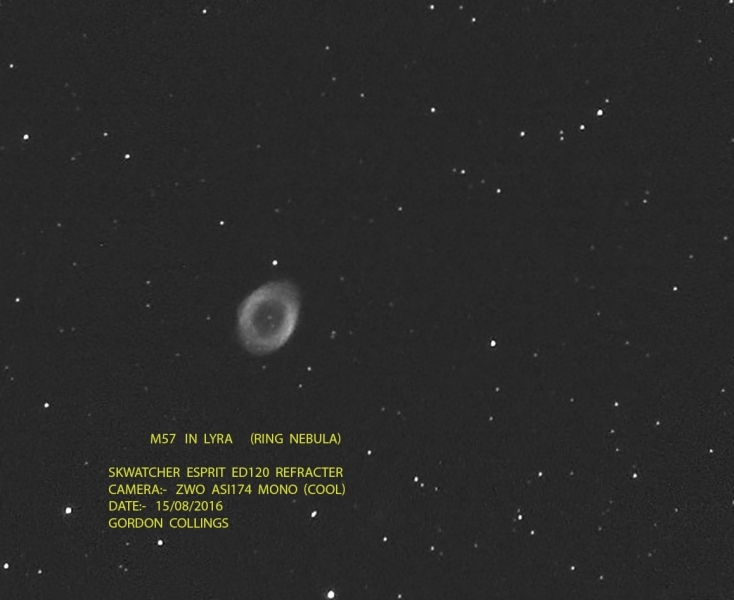 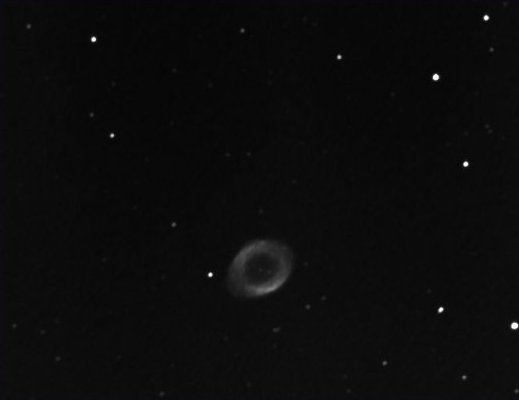 However, there is some contention to this claim, as Isaac Roberts in 1891 did suggest that M76 might be similar to the Ring Nebula (M57), being instead as seen from the side view. 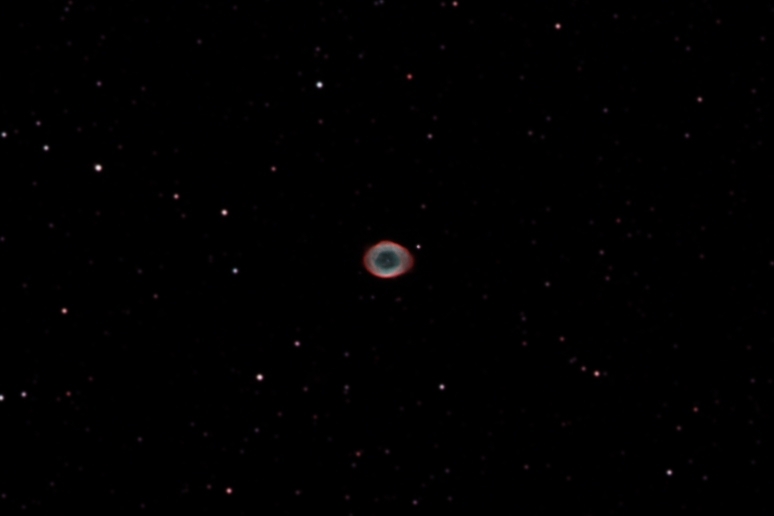 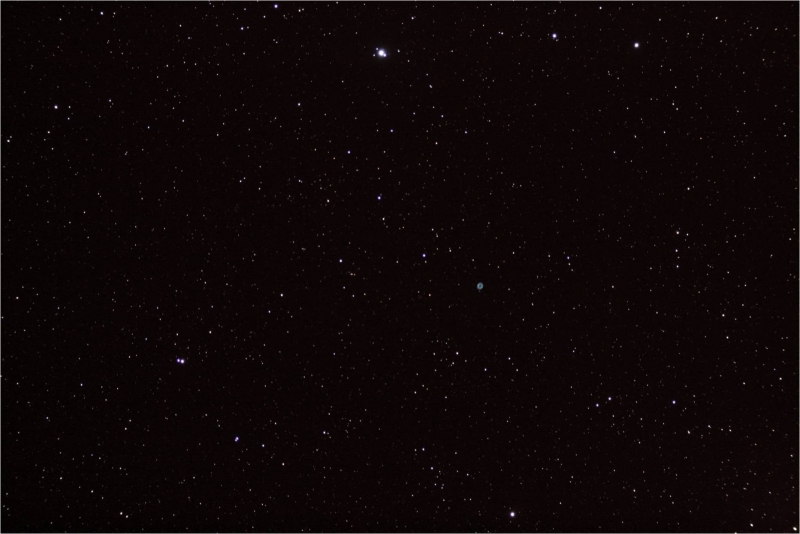 The structure is now classed as a bipolar planetary nebula (BPNe).Distance to M76 is currently estimated as 780 parsecs or 2,500 light years, making the average dimensions about 0.378 pc. 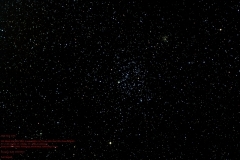 (1.23 ly.) 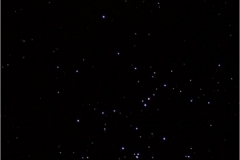 across. 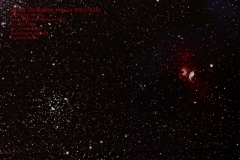 The total nebula shines at the apparent magnitude of +10.1 with its central star or planetary nebula nucleus (PNN) at +15.9v (16.1B) magnitude. 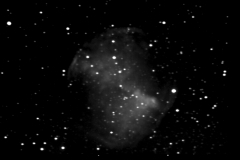 The UV-light from the PNN is expanding outer layers that form the present nebula, and has the surface temperature of about 88,400 K. The whole planetary nebula is approaching us at 19.1 km/s. 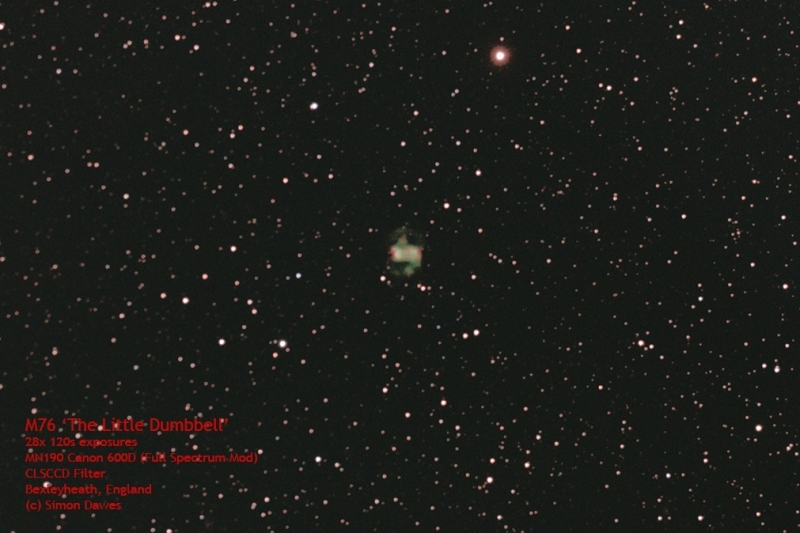 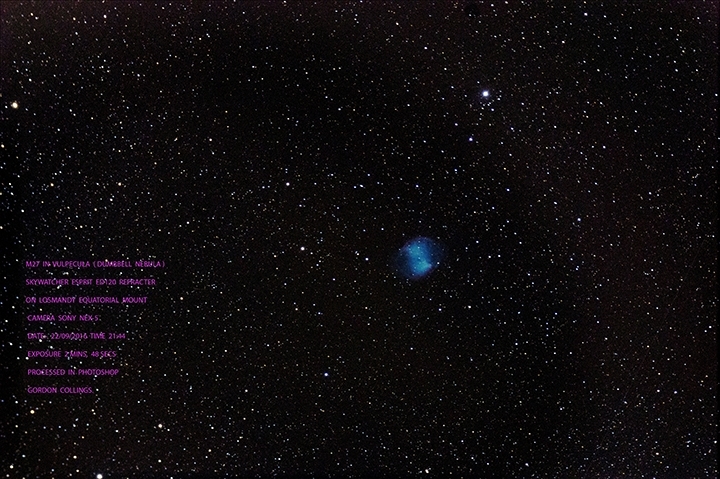 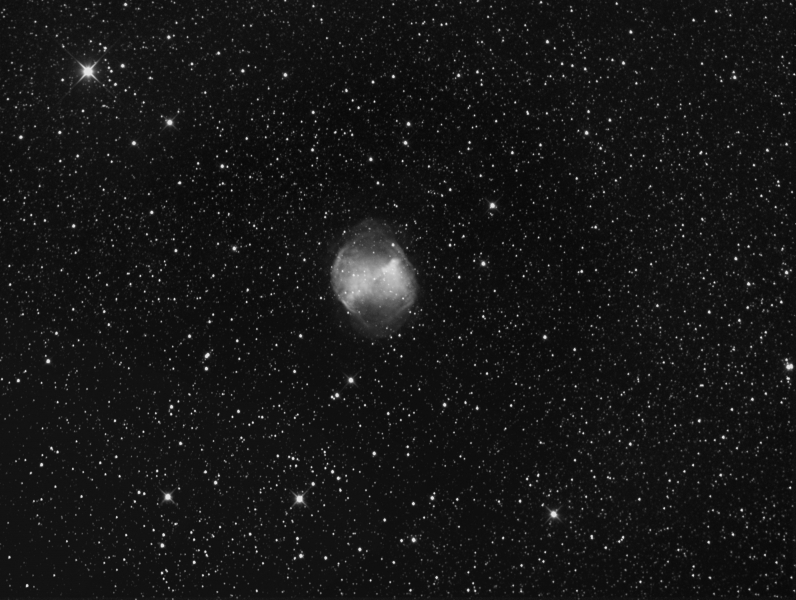 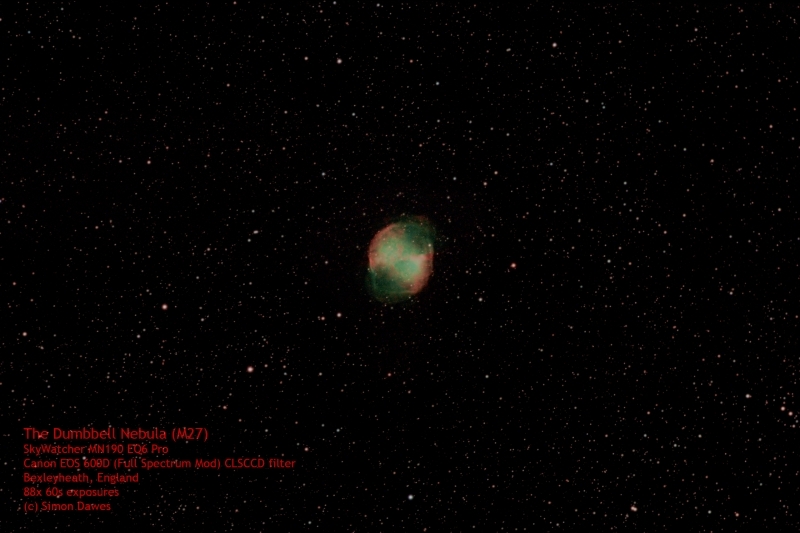 The Little Dumbbell Nebula derives its common name from its resemblance to the Dumbbell Nebula (M27) in Vulpecula. 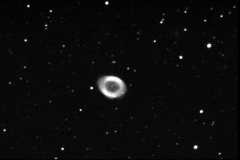 It was originally thought to consist of two separate emission nebulae and was thus given two catalogue numbers in the NGC 650 and 651. 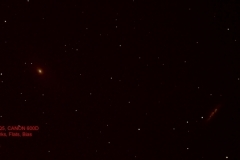 Some consider this object to be one of the faintest and hardest to see. 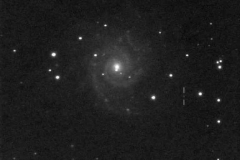 Messier 74 (also known as NGC 628 and Phantom Galaxy) is a spiral galaxy in the constellation Pisces. It is at a distance of about 32 million light-years away from Earth. 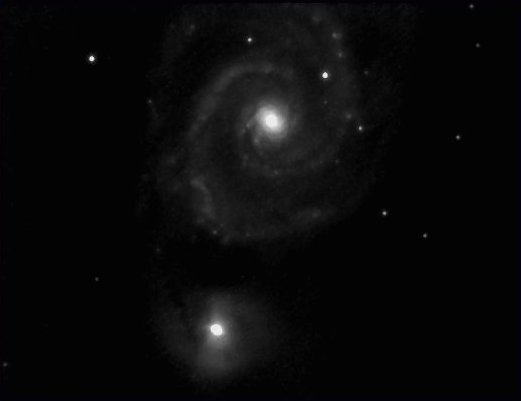 The galaxy contains two clearly defined spiral arms and is therefore used as an archetypal example of a grand design spiral galaxy. The galaxy’s low surface brightness makes it the most difficult Messier object for amateur astronomers to observe. 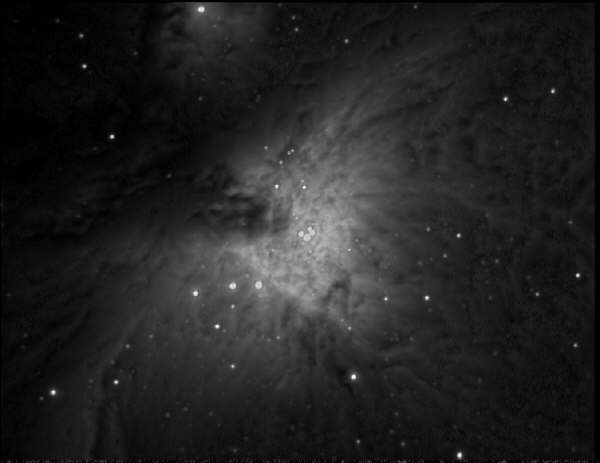 It is estimated that M74 is home to about 100 billion stars. 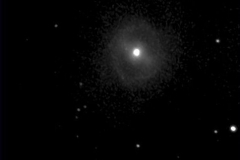 The Black Eye Galaxy (also called Evil Eye Galaxy; designated Messier 64, M64, or NGC 4826) is a galaxy which was discovered by Edward Pigott in March 1779, and independently by Johann Elert Bode in April of the same year, as well as by Charles Messier in 1780. 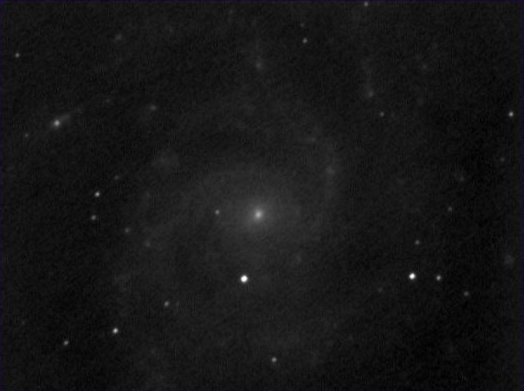 It has a spectacular dark band of absorbing dust in front of the galaxy’s bright nucleus, giving rise to its nicknames of the “Black Eye” or “Evil Eye” galaxy. 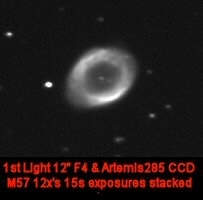 M64 is well known among amateur astronomers because of its appearance in small telescopes. 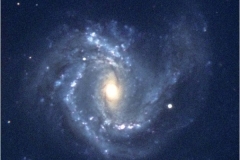 It is a spiral galaxy in the Coma Berenices constellation. 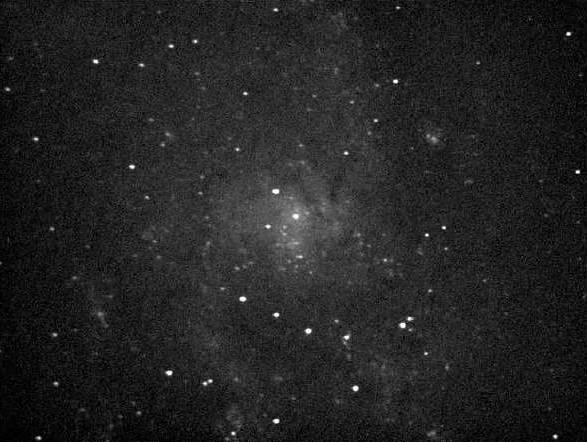 Messier 63 (also known as NGC 5055, or the Sunflower Galaxy) is a spiral galaxy in the constellation Canes Venatici consisting of a central disc surrounded by many short spiral arm segments, the galaxy form known as flocculent. 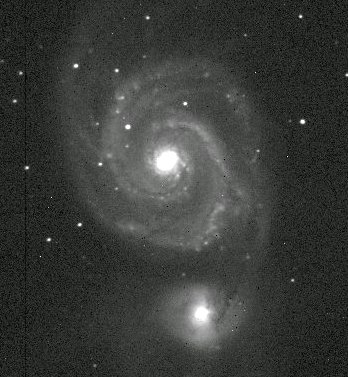 M63 is part of the M51 Group, a group of galaxies that also includes M51 (the ‘Whirlpool Galaxy’). 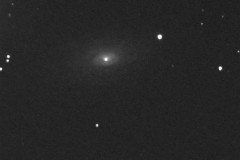 M63 is an active galaxy with a LINER nucleus. The existence of a super massive black hole at the nucleus is uncertain; if it does exist, then the mass is estimated as (8.5±1.9)×10^8 M☉. 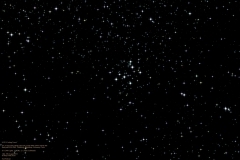 Messier 39 (also known as NGC 7092) is a loose open cluster with about 30 members, in the constellation of Cygnus. 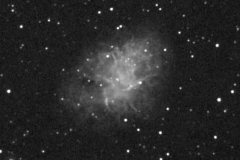 It was discovered by Charles Messier in 1764. 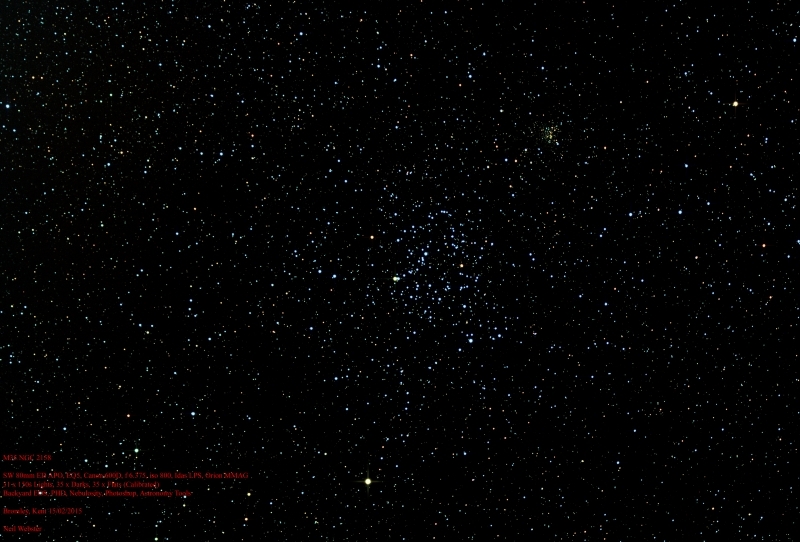 M39 is at a distance of about 326 pc (1,060 ly) from Earth whose age is estimated to be from 278 million years. Messier 35 (also known as NGC 2168) is an open cluster in the constellation Gemini. 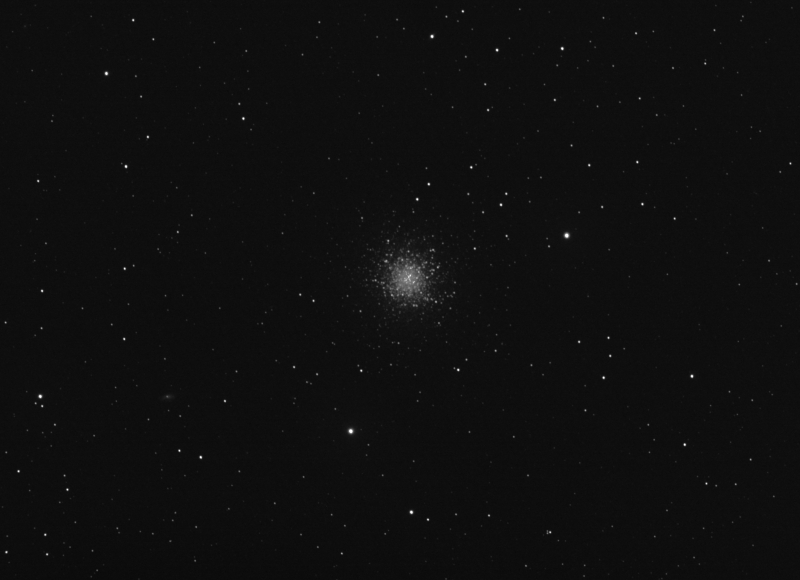 It was discovered by Philippe Loys de Chéseaux in 1745 and independently discovered by John Bevis before 1750. 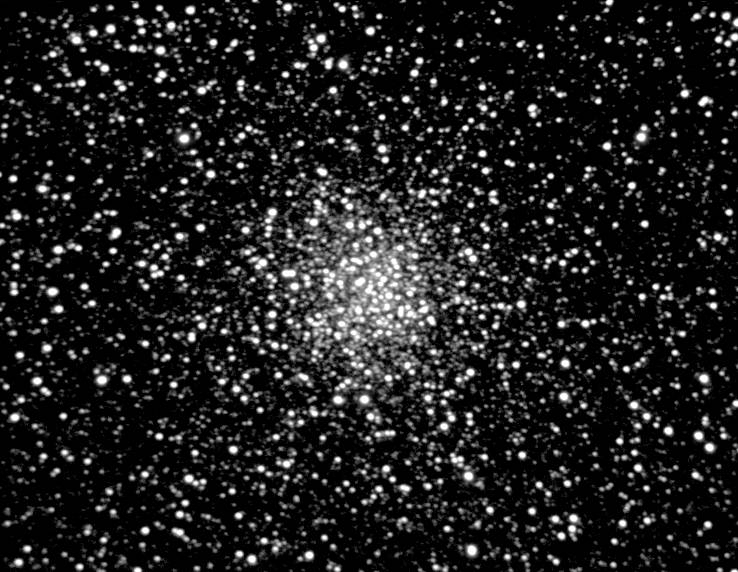 The cluster is scattered over an area of the sky almost the size of the full moon and is located 850 parsecs (2,800 light-years) from Earth. 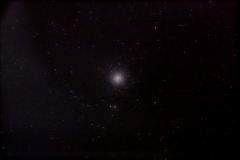 Messier 110 (also known as M110 and NGC 205) is a dwarf elliptical galaxy that is a satellite of the Andromeda Galaxy. 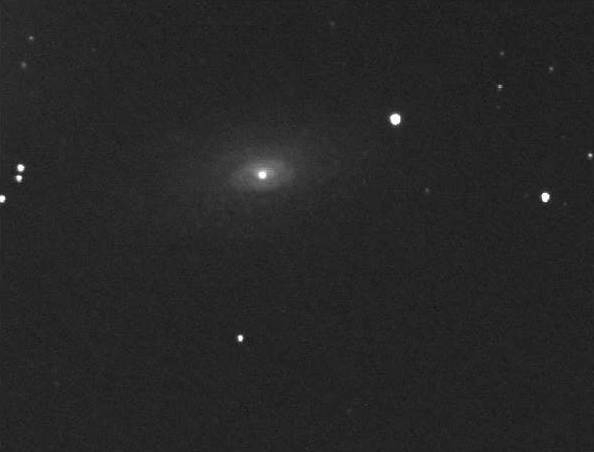 M110 contains some dust and hints of recent star formation, which is unusual for dwarf elliptical galaxies in general. 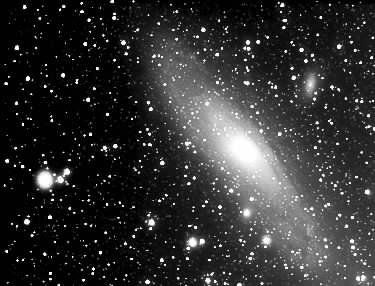 Although Charles Messier never included the galaxy in his famous list, it was depicted by him, together with M32, on a drawing of the Andromeda galaxy; a label on the drawing indicates that Messier first observed NGC 205 on August 10, 1773. The galaxy was independently discovered by Caroline Herschel on August 27, 1783; her brother William Herschel described her discovery in 1785. 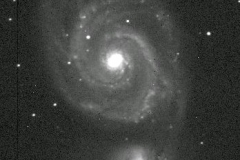 The suggestion to assign the galaxy a Messier number was made by Kenneth Glyn Jones in 1967. 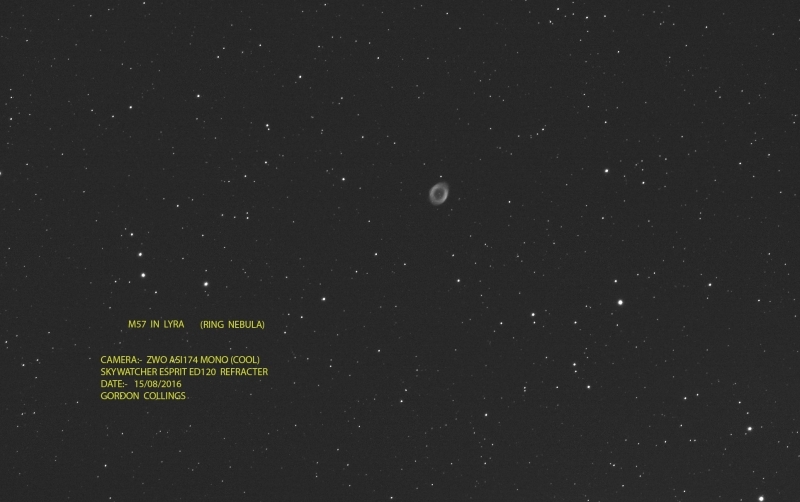 In 1999, Johnson and Modjaz discovered a nova in M110. Messier 85 (also known as M85 or NGC 4382) is a lenticular galaxy (type S0) in the Coma Berenices constellation. 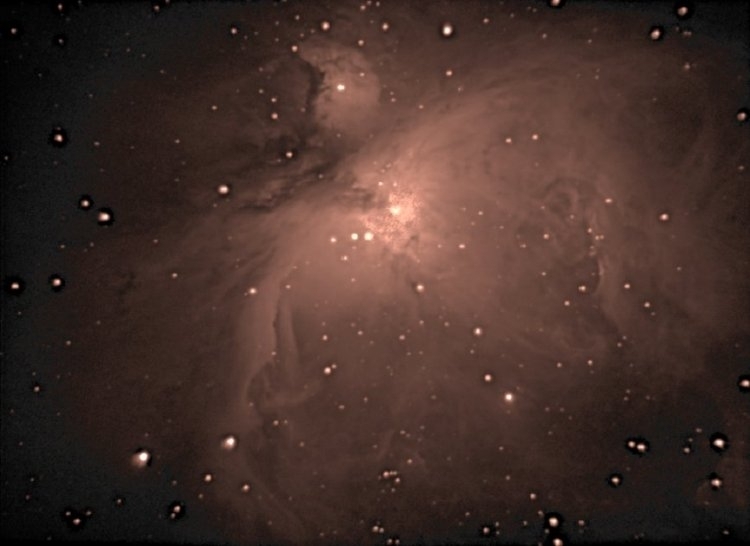 It is 60 million light years away, making it the 94th most distant Messier object, and it estimated to be 125,000 light years across. 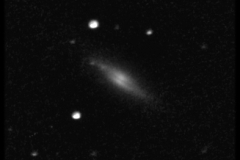 It was discovered by Pierre Méchain in 1781. 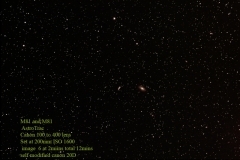 It is the northern most outlier of the Virgo cluster. 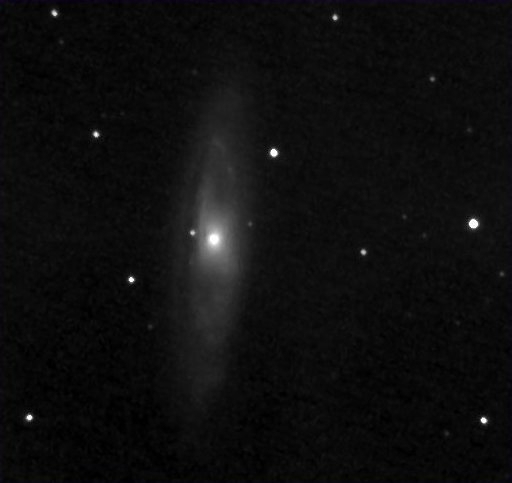 The type I supernova, 1960R was discovered in M85 on Dec 20, 1960 and reached an apparent magnitude of 11.7. 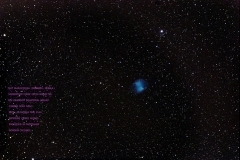 M85 is interacting with the nearby spiral galaxy NGC 4394, and a small elliptical galaxy called MCG 3-32-38. 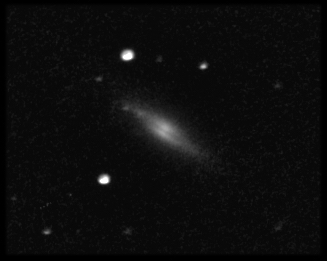 Messier 82 (also known as NGC 3034 or the Cigar Galaxy) is a nearby starburst galaxy about 12 million light-years away in the constellation Ursa Major. 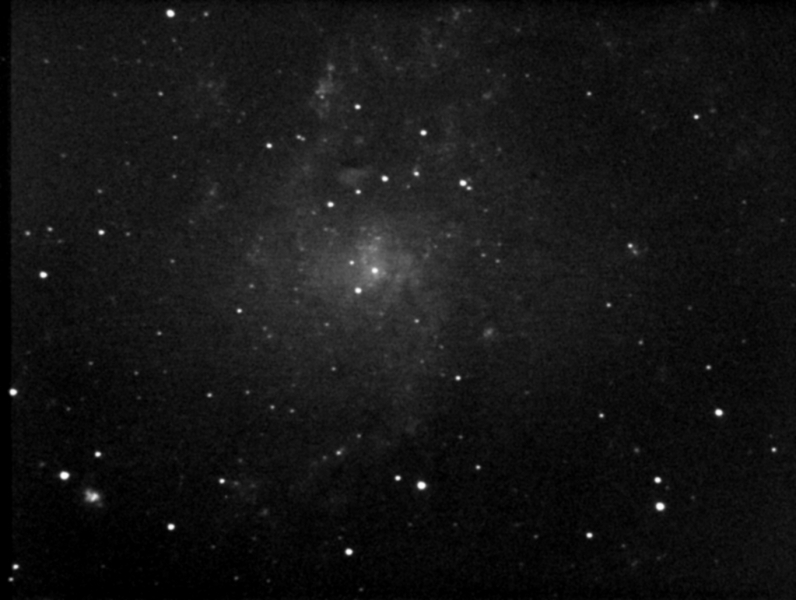 The starburst galaxy is five times as bright as the whole Milky Way and one hundred times as bright as our galaxy’s centre. 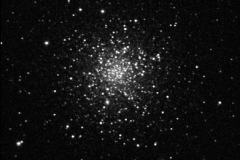 In 2005, the Hubble revealed 197 young massive clusters in the starburst core. 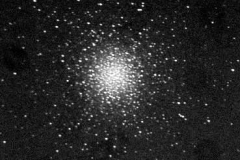 The average mass of these clusters is around 2 × 105 solar masses, hence the starburst core is a very energetic and high-density environment. 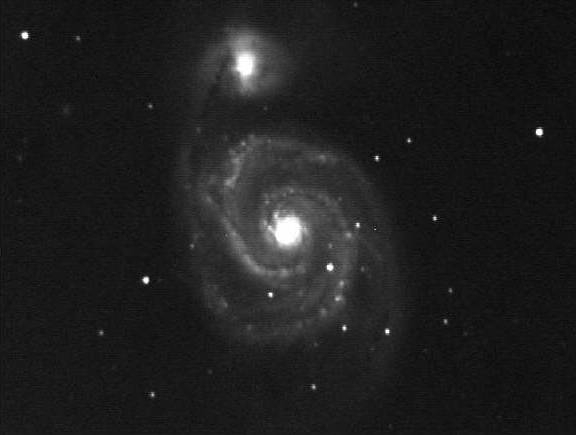 Throughout the galaxy’s centre, young stars are being born 10 times faster than they are inside our entire Milky Way Galaxy. 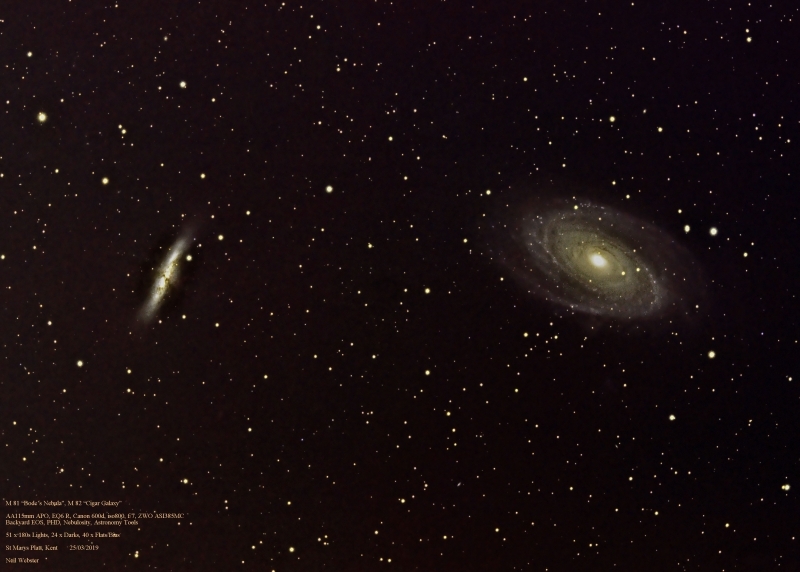 Messier 81 is a spiral galaxy about 12 million light-years away in the constellation Ursa Major. 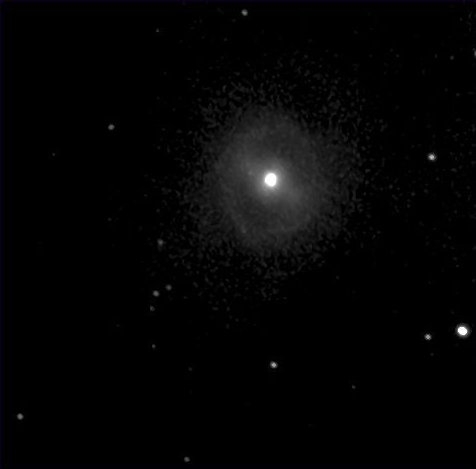 M81 is one of the most striking examples of a grand design spiral galaxy, with near perfect arms spiralling into the very centre. 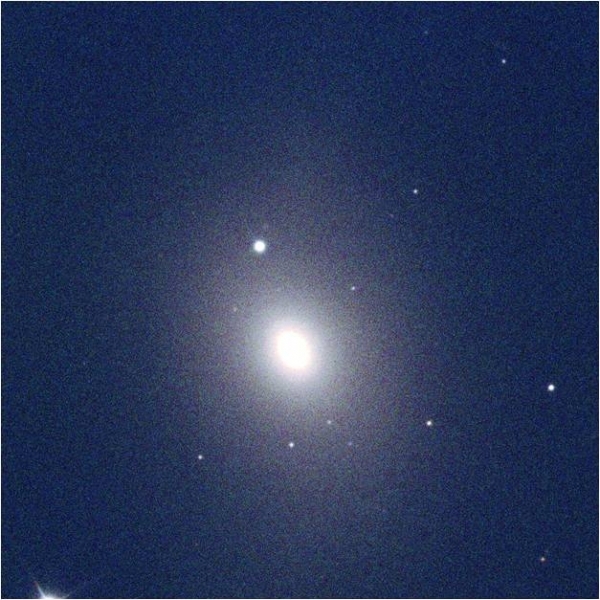 Because of its proximity to Earth, its large size, and its active galactic nucleus (which harbours a 70 million solar mass supermassive black hole). 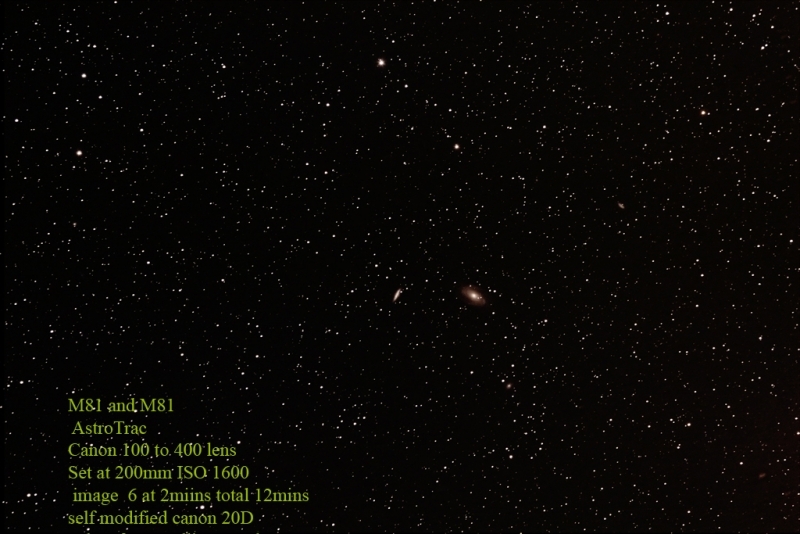 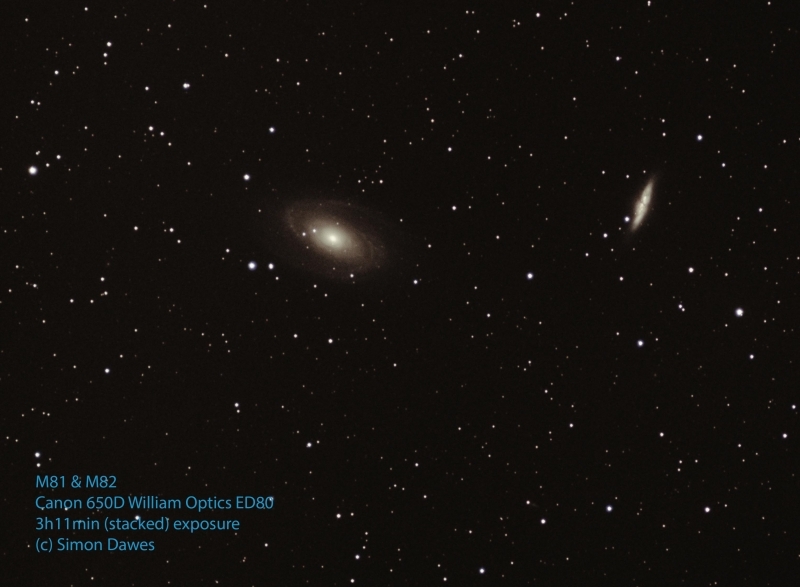 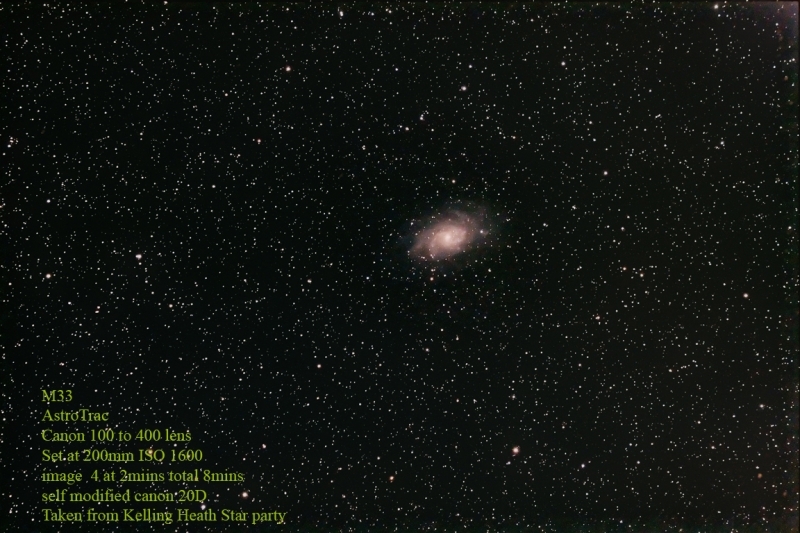 It is close by M82 which is also worth a look if you are in this region. 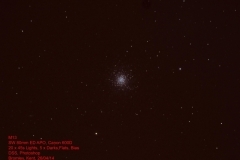 Messier 71 (also known as NGC 6838) is a globular cluster in the constellation Sagitta. It was discovered by Philippe Loys de Chéseaux in 1745 and included by Charles Messier in his catalogue of comet-like objects in 1780. 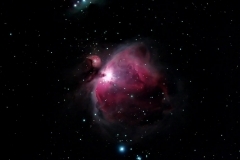 It was also noted by Koehler at Dresden around 1775. 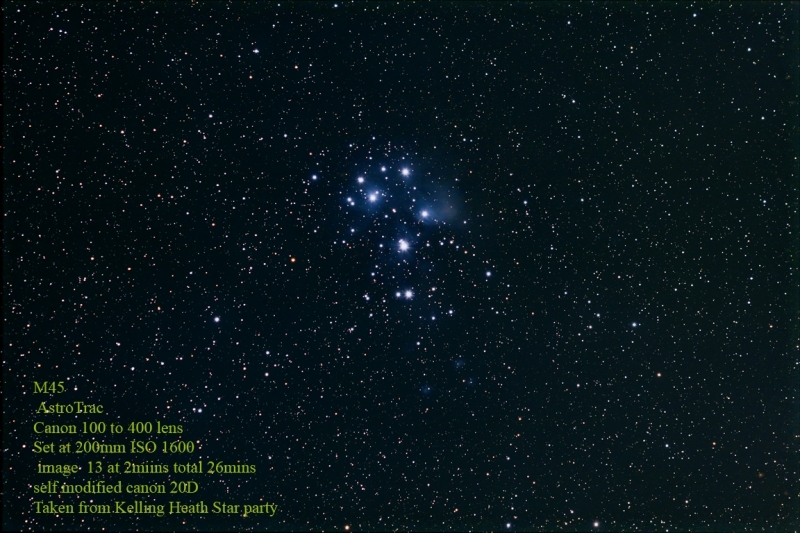 The star cluster is at a distance of about 12,000 light years away from Earth and spans some 27 light years across. 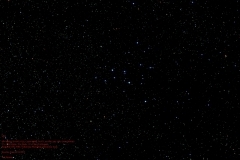 The irregular variable star Z Sagittae is a member of this cluster. 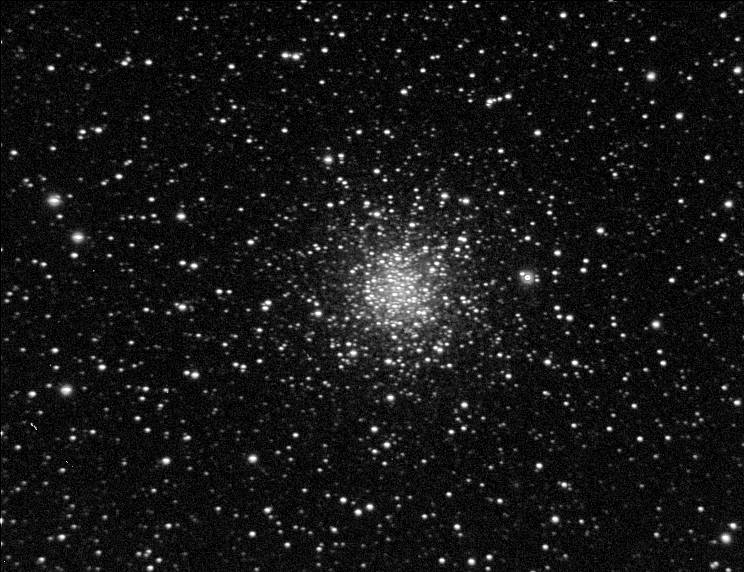 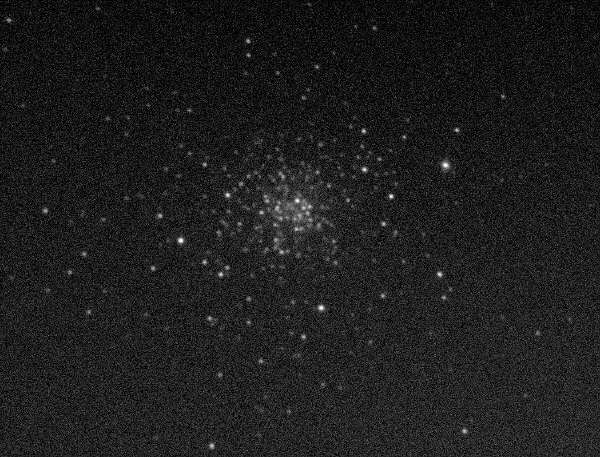 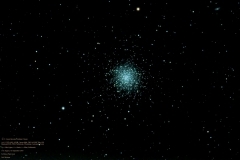 M71 was long thought (until the 1970s) to be a densely packed open cluster, however, modern photometric photometry has detected a short “horizontal branch” in the H-R diagram of M71, which is characteristic of a globular cluster. 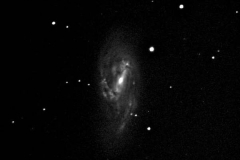 Messier 66 (also known as NGC 3627) is an intermediate spiral galaxy about 36 million light-years away in the constellation Leo. It was discovered by Charles Messier in 1780. 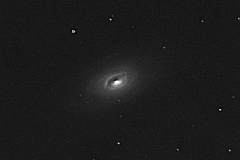 M66 is about 95 thousand light-years across with striking dust lanes and bright star clusters along sweeping spiral arms. 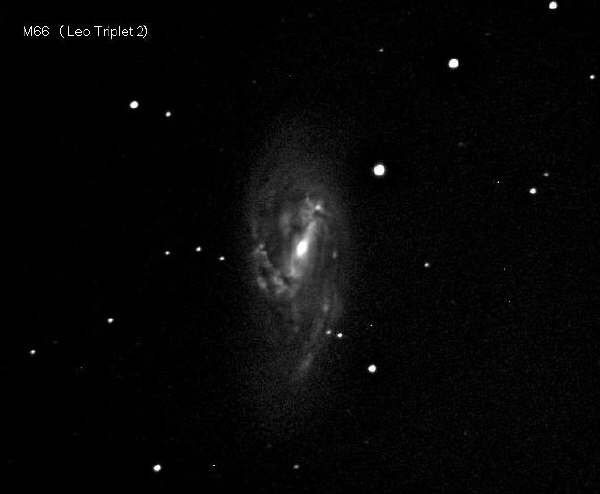 M66 is part of the famous Leo Triplet, a small group of galaxies that also includes M65 and NGC 3628. 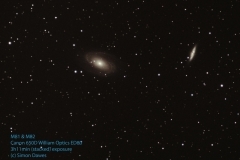 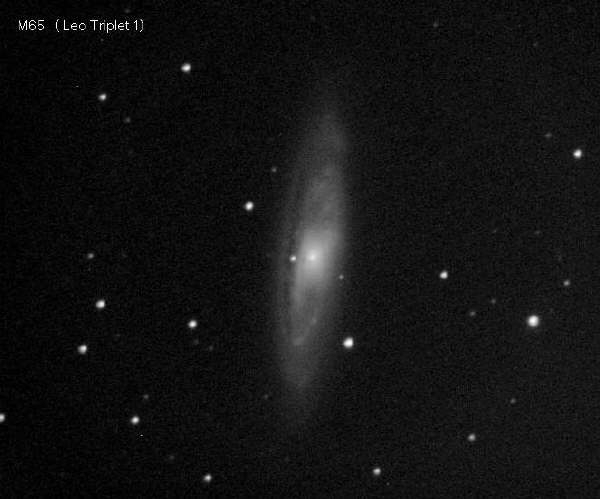 M65 is part of the Leo triplet along with M66 and NGC3628. 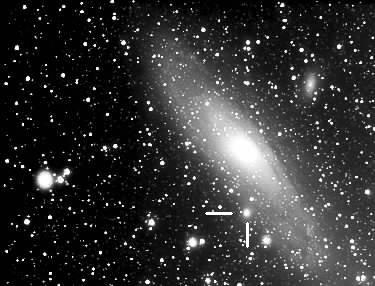 The galaxy is low in dust and gas, and there is little star formation in it, although there has been some relatively recently in the arms. 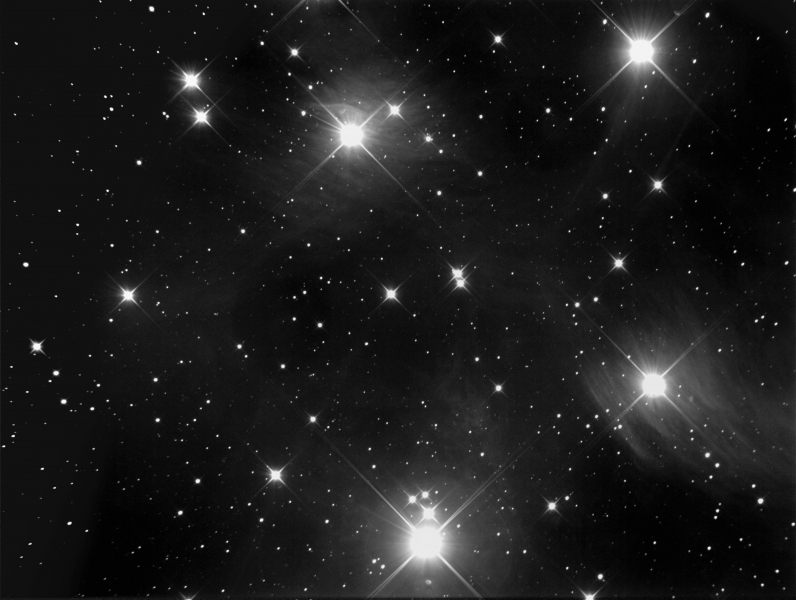 The ratio of old stars to new stars is correspondingly quite high. 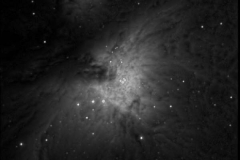 In most wavelengths it is quite uninteresting, though there is a radio source visible in the NVSS, offset from the core by about two arc-minutes. 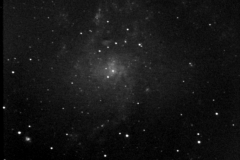 The identity of the source is uncertain, as it has not been identified visually, or formally studied in any published papers. 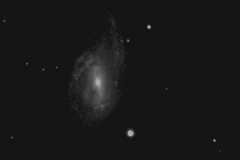 Messier 61 (also known as NGC 4303) is an intermediate barred spiral galaxy in the Virgo Cluster of galaxies. 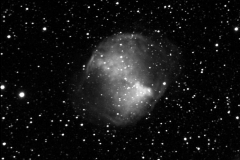 It was discovered by Barnaba Oriani on May 5, 1779. 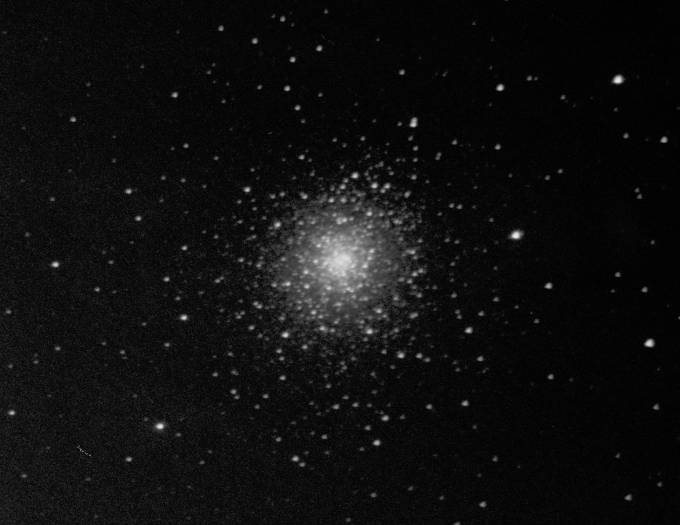 This was six days before Charles Messier observed the same galaxy, but had mistaken it as a comet. 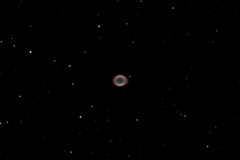 The Ring Nebula (also known as NGC 6720) is a planetary nebula in the northern constellation of Lyra. 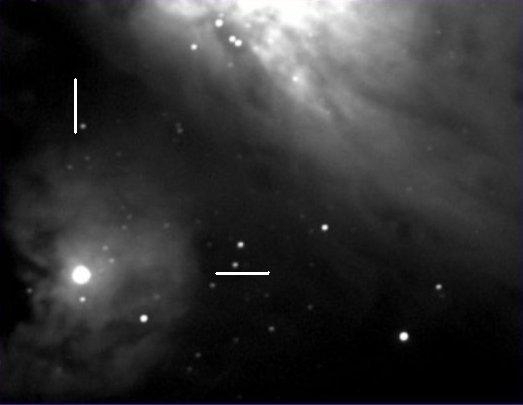 Such objects are formed when a shell of ionized gas is expelled into the surrounding interstellar medium by a red giant star, which was passing through the last stage in its evolution before becoming a white dwarf. 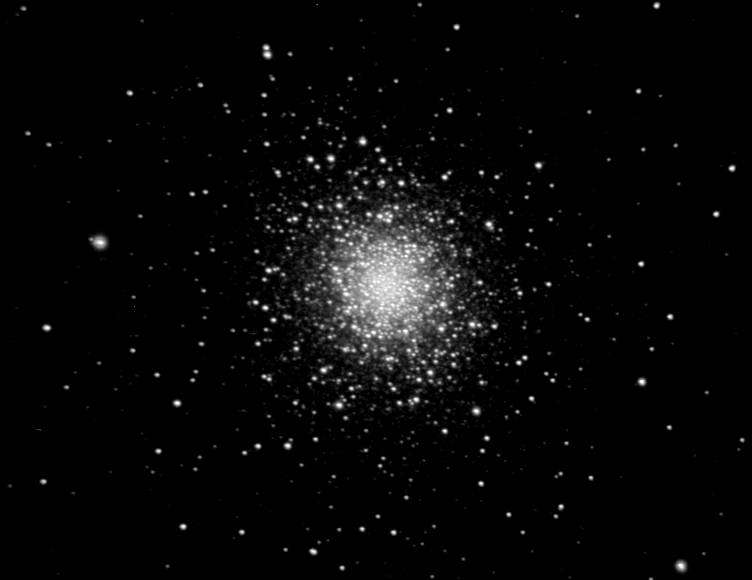 Messier 56 (also known as NGC 6779) is a globular cluster in the constellation Lyra. 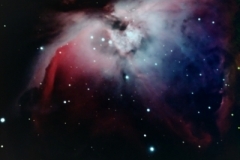 It was discovered by Charles Messier in 1779. 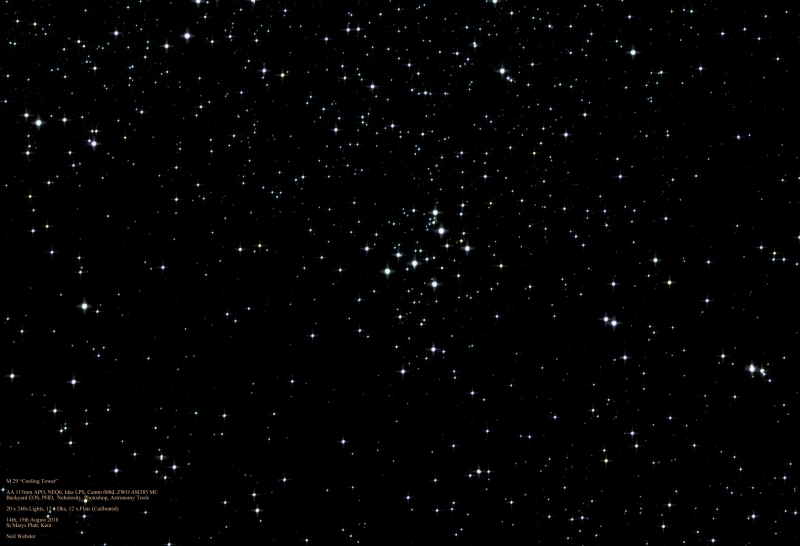 M56 is at a distance of about 32,900 light-years from Earth and measures roughly 84 light-years across. 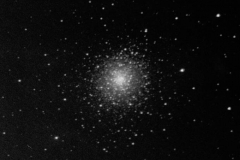 Messier 53 (also known as NGC 5024) is a globular cluster in the Coma Berenices constellation. 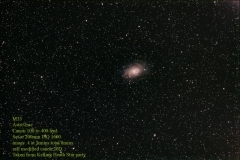 It was discovered by Johann Elert Bode in 1775. 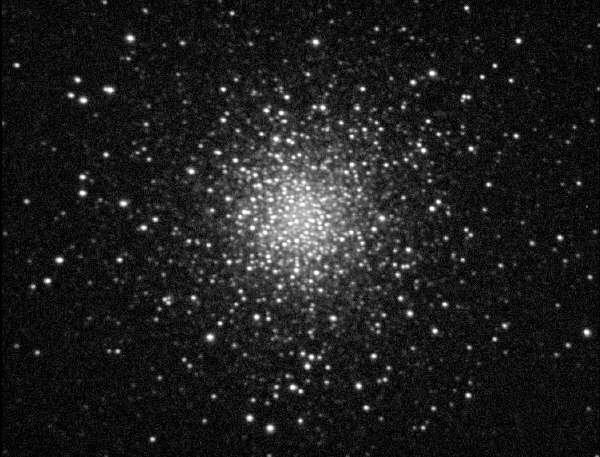 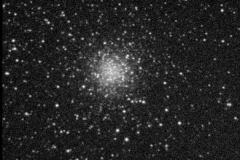 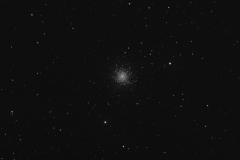 M53 is one of the more outlying globular clusters, being about 60,000 light-years away from the Galactic Centre, and almost the same distance (about 58,000 light-years) from the Solar system. 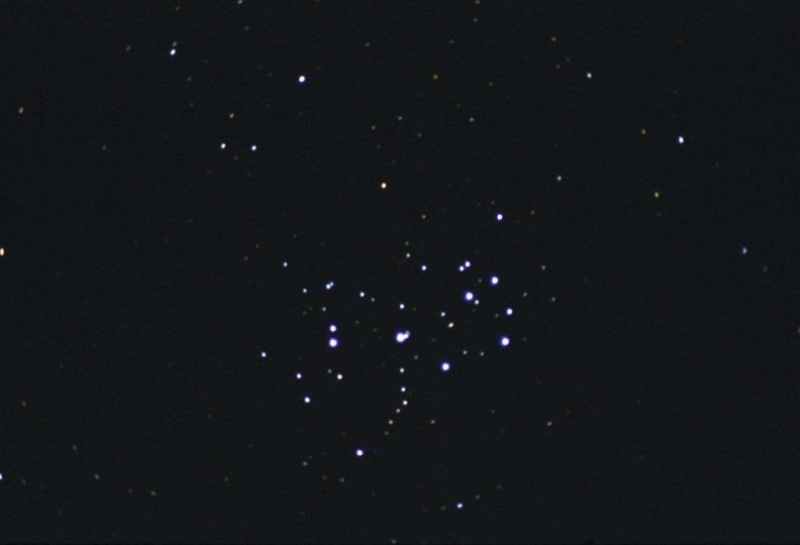 Messier 52 (also known as NGC 7654) is an open cluster in the Cassiopeia constellation. 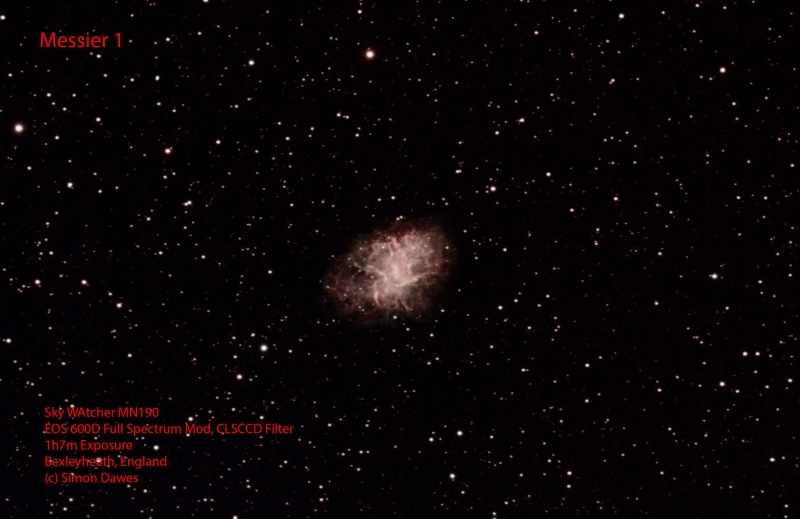 It was discovered by Charles Messier in 1774. 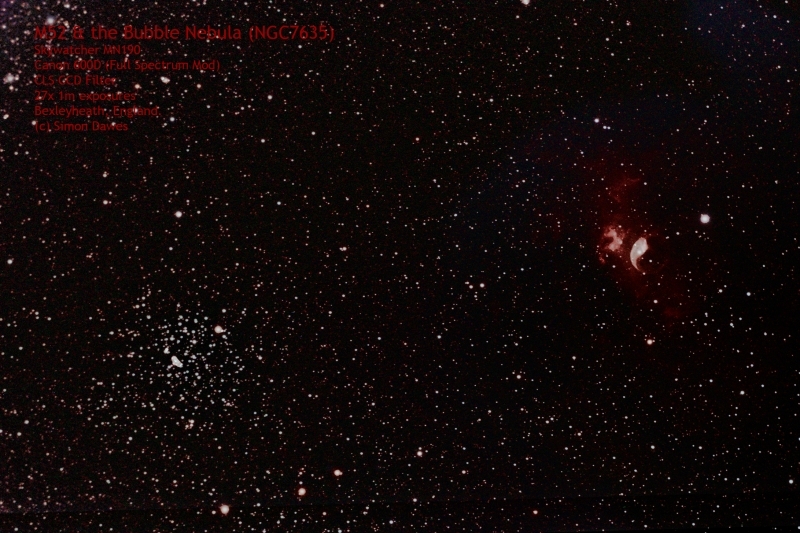 M52 can be seen from Earth with binoculars. 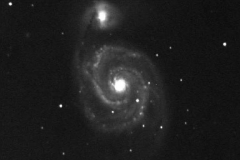 The Whirlpool Galaxy (also known as NGC 5194) is an interacting grand-design spiral galaxy located at a distance of approximately 23 million light-years in the constellation Canes Venatici. 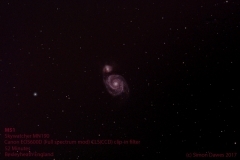 It is one of the most famous spiral galaxies in the sky. 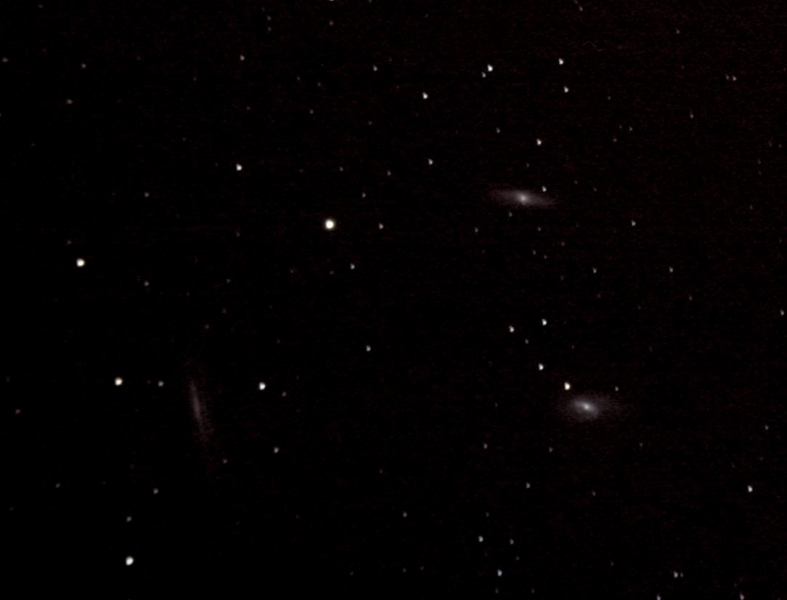 The galaxy and its companion (NGC 5195) are easily observed by amateur astronomers, and the two galaxies may even be seen with binoculars. 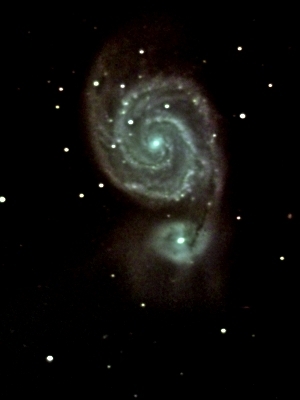 The Whirlpool Galaxy is also a popular target for professional astronomers, who study it to further understand galaxy structure (particularly structure associated with the spiral arms) and galaxy interactions. 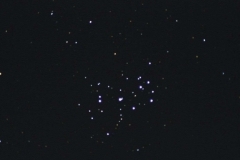 The Beehive Cluster (also known as Praesepe (Latin for “manger”), M44, NGC 2632, or Cr 189) is an open cluster in the constellation Cancer. 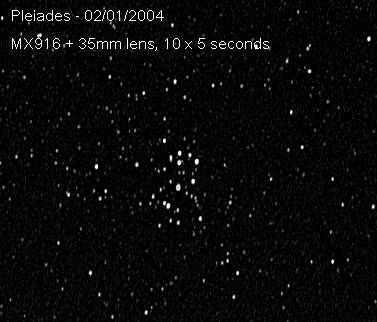 It is one of the nearest open clusters to the Solar System, and it contains a larger star population than most other nearby clusters. 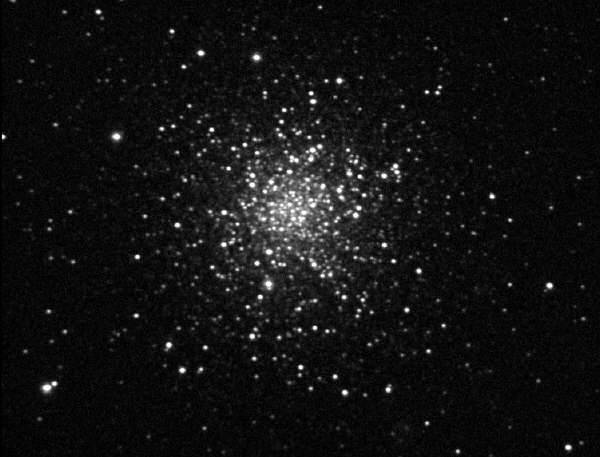 Under dark skies the Beehive Cluster looks like a nebulous object to the naked eye; thus it has been known since ancient times. 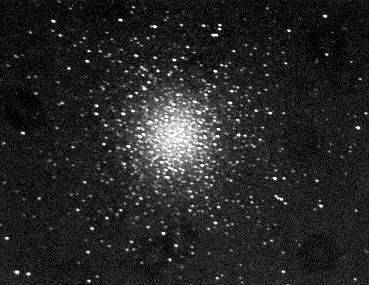 The classical astronomer Ptolemy called it “the nebulous mass in the breast of Cancer,” and it was among the first objects that Galileo studied with his telescope. 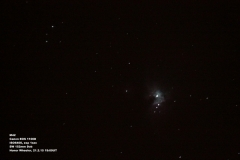 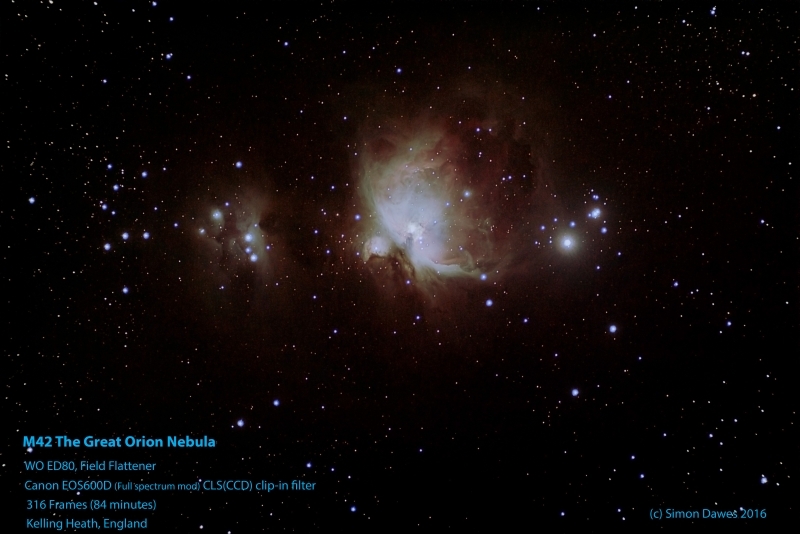 Messier 43 (also known De Mairan’s Nebula, and NGC 1982) is an H II region in the Orion constellation. 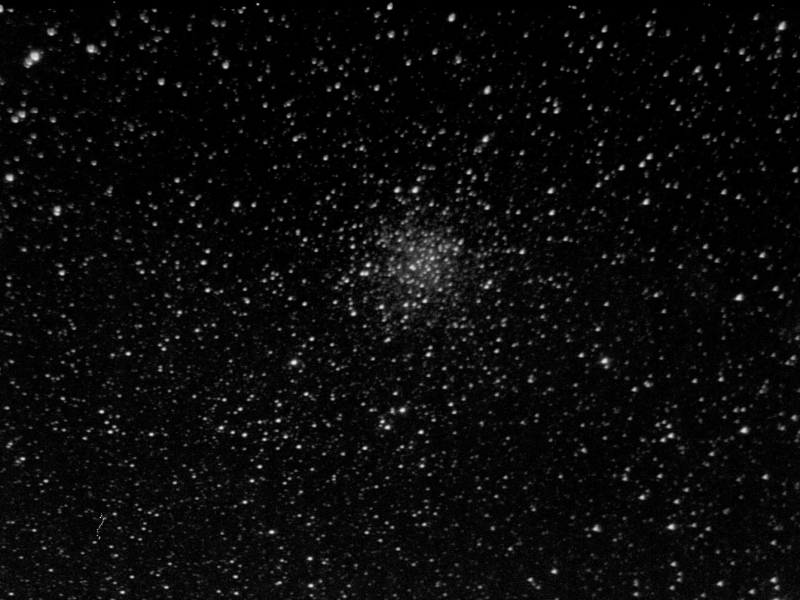 It was discovered by Jean-Jacques Dortous de Mairan before 1731. 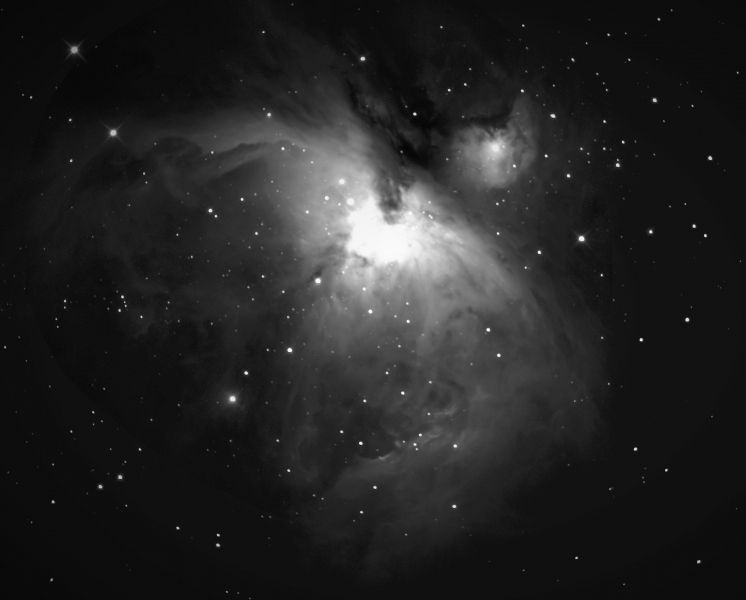 The De Mairan’s Nebula is part of the Orion Nebula, separated from the main nebula by a lane of dust. 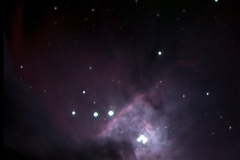 It is part of the much larger Orion Molecular Cloud Complex. 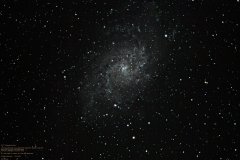 The Triangulum Galaxy (also known as NGC 598) is a spiral galaxy approximately 3 million light-years away in the constellation Triangulum. 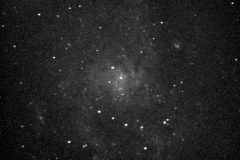 The galaxy is also sometimes informally referred to as the Pinwheel Galaxy by some amateur astronomy references and in some public outreach websites. 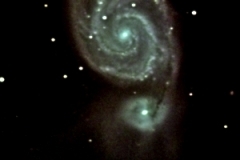 However, the SIMBAD Astronomical Database, a professional astronomy database that contains formal designations for astronomical objects, indicates that the name “Pinwheel Galaxy” is used to refer to Messier 101, and several other amateur astronomy resources and other public outreach websites also identify Messier 101 by that name. It is the third largest galaxy in the Local Group, a group of galaxies that also contains the Milky Way Galaxy and the Andromeda Galaxy, and it may be a gravitationally bound companion of the Andromeda Galaxy. The Pisces Dwarf (LGS 3), one of the small Local Group member galaxies, is possibly a satellite of Triangulum. The Andromeda Galaxy (also known as M31, or NGC 224 and often referred to as the Great Andromeda Nebula) is a spiral galaxy approximately 2.5 million light-years away in the constellation Andromeda. 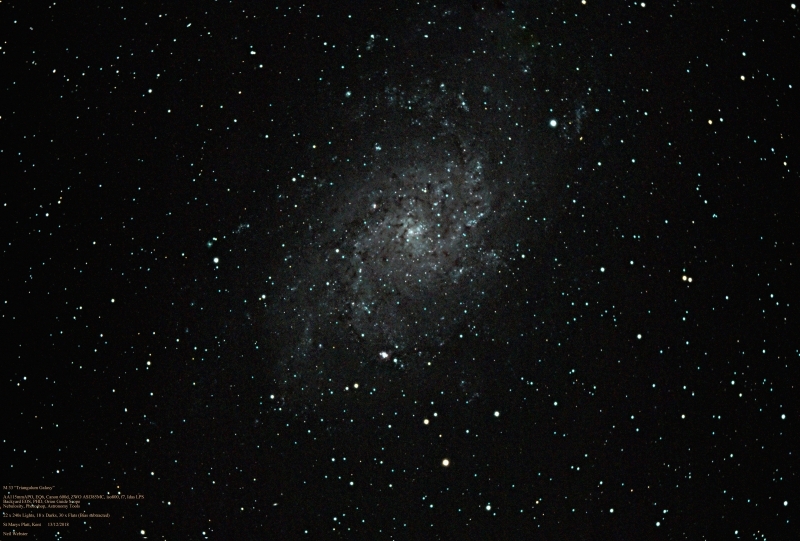 It is the nearest spiral galaxy to our own, the Milky Way. 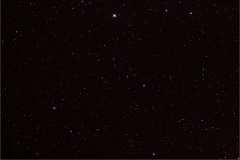 As it is visible as a faint smudge on a moonless night, it is one of the farthest objects visible to the naked eye, and can be seen even from urban areas with binoculars. 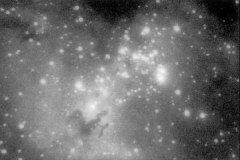 The Eagle Nebula (also known as M16 or NGC 6611), perhaps one of the most famous and easily recognized space objects, is a young open cluster of stars in the constellation Serpens, discovered by Jean-Philippe de Cheseaux in 1745-46. 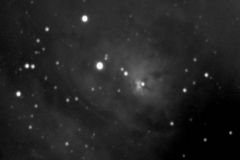 It is associated with a diffuse emission nebula, or H II region, which is catalogued as IC 4703. This region of active current star formation is about 7,000 light-years distant. 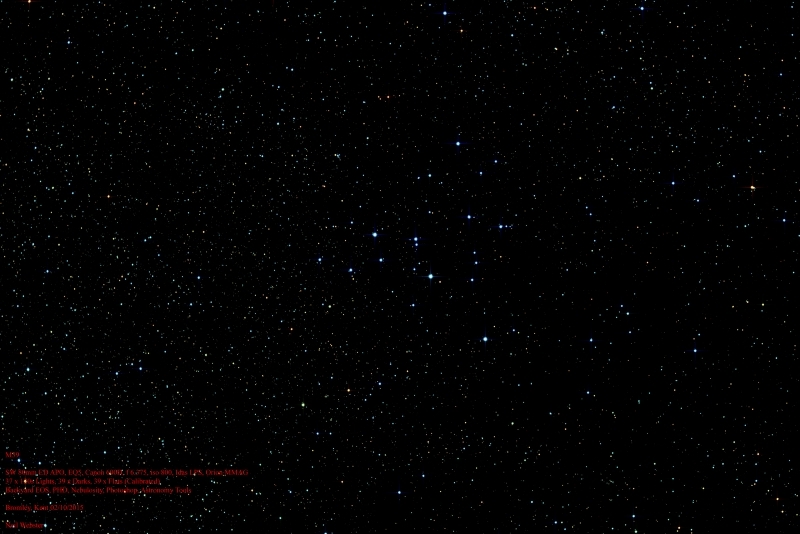 The brightest star in the nebula has an apparent magnitude of 8.24, easily visible with good binoculars. 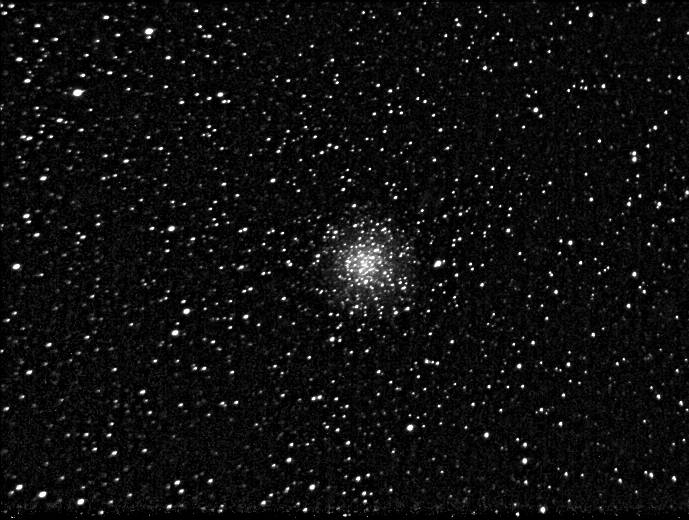 Globular Cluster M15 (also known as NGC 7078) is a globular cluster in the constellation Pegasus. 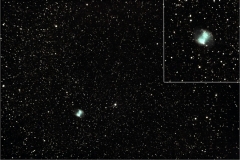 It was discovered by Jean-Dominique Maraldi in 1746 and included in Charles Messier’s catalogue of comet-like objects in 1764. 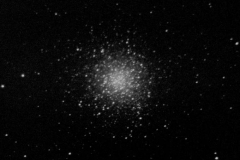 It is estimated to be 13.2 billion years old, one of the oldest globular clusters. 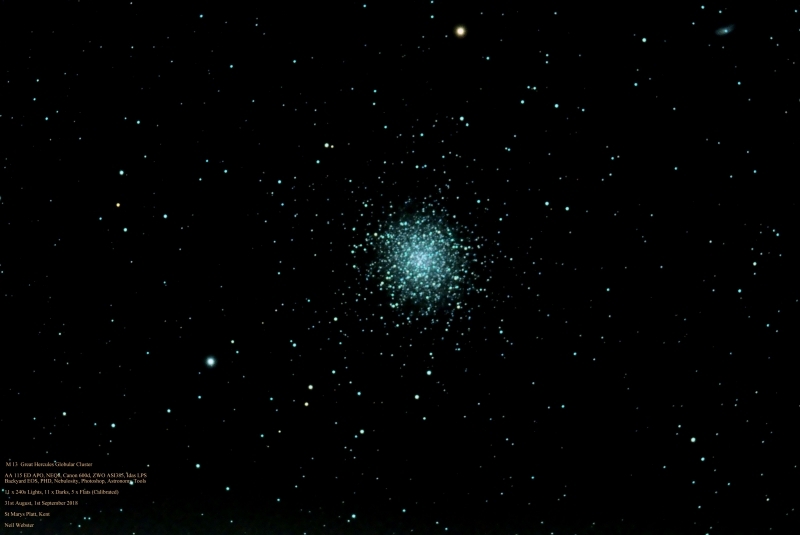 M15 is at a distance of about 33,600 light-years from Earth. 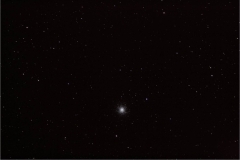 It has an absolute magnitude of -9.2 which translates to a total luminosity of 360,000 times that of the Sun. Messier 15 is one of the most densely packed globulars known in the Milky Way galaxy. Messier 14 (also known as NGC 6402) is a globular cluster in the constellation Ophiuchus. It was discovered by Charles Messier in 1764. 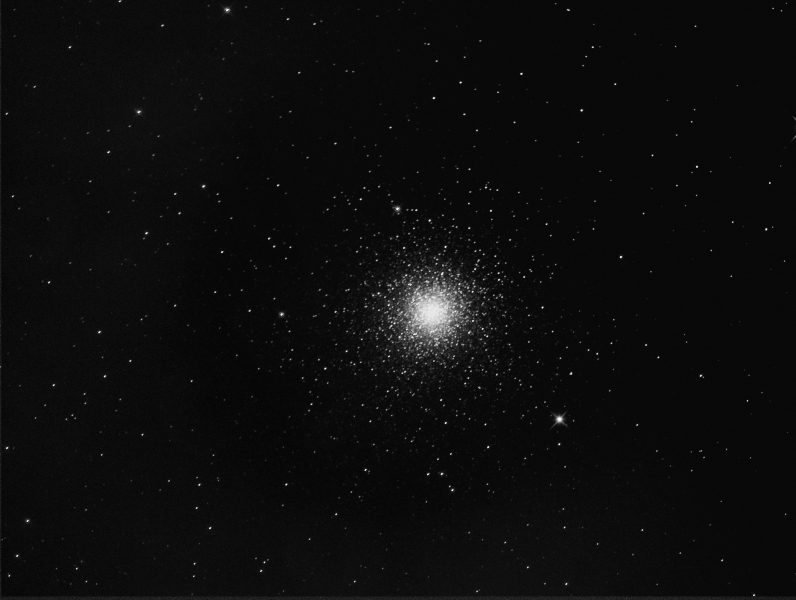 M12 (also known as NGC 6218) is a globular cluster in the constellation Ophiuchus. 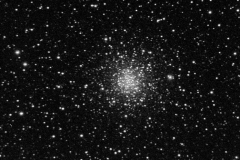 It was discovered by Charles Messier on May 30, 1764. 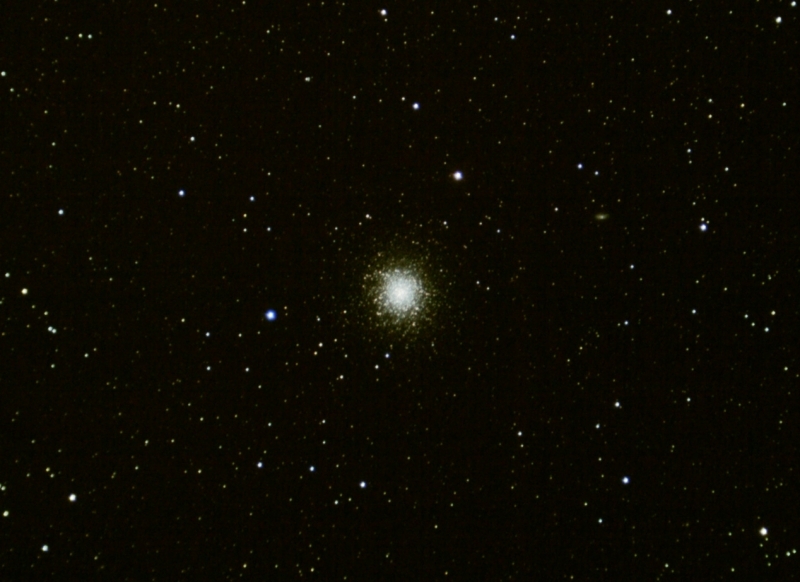 Located roughly 3° from the cluster M10, M12 is about 16,000 light-years distant and has a spatial diameter of ~75 light-years. 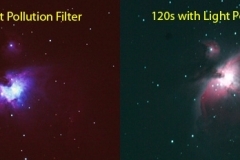 The brightest stars of M12 are of 12th magnitude. 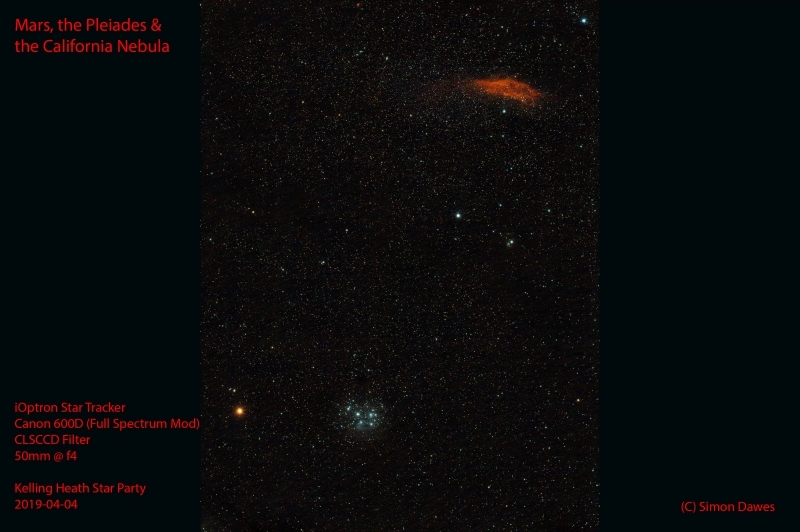 It is rather loosely packed for a globular and M12 was once thought to be a tightly concentrated open cluster. 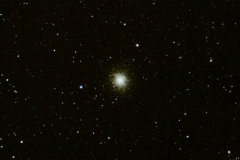 M10 has an apparent diameter of some 20′, about 2/3 the apparent diameter of the moon, which translates to a spatial diameter of 83 light-years at its estimated distance of 14,300 light-years. 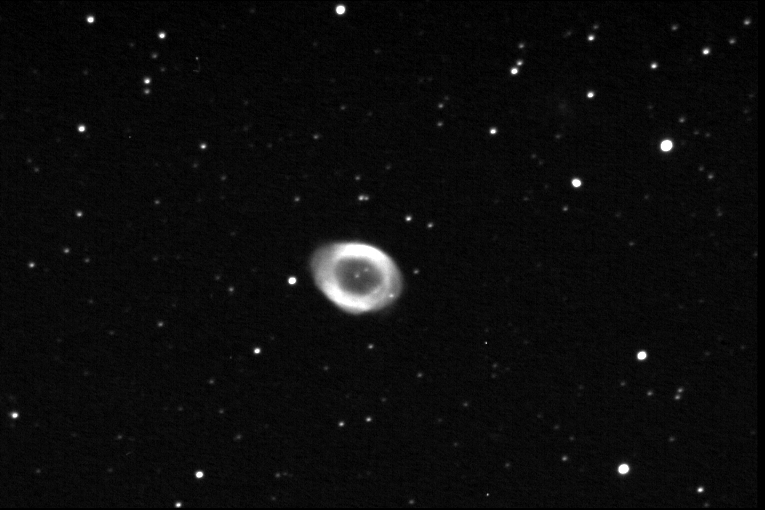 Viewed through medium sized telescopes it appears about half that size (8′ to 9′), as its brighter core is only 35 light-years across. 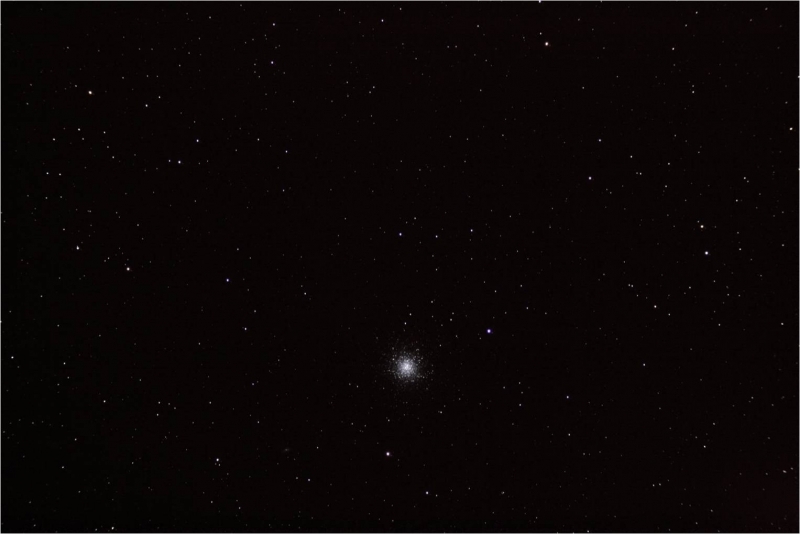 Messier 9 (also known NGC 6333) is a globular cluster in the constellation Ophiuchus. 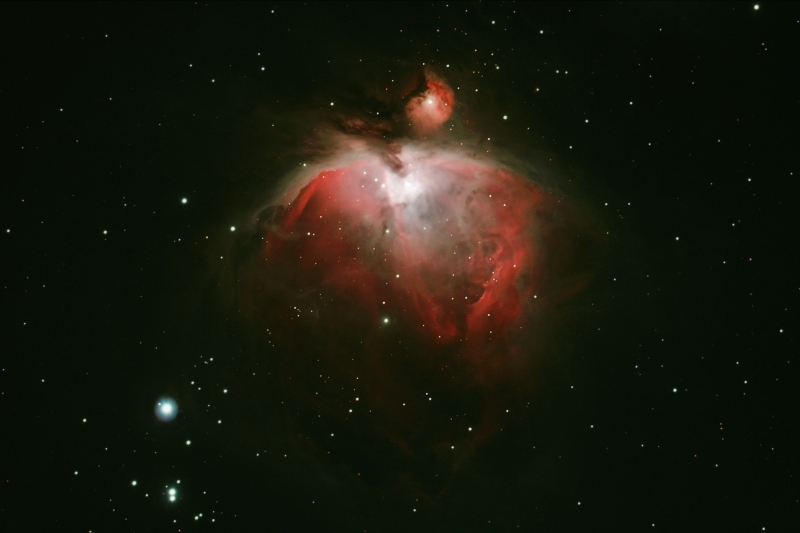 It was discovered by Charles Messier in 1764. 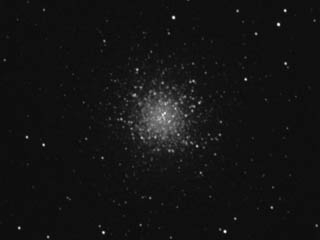 M9 is one of the nearer globular clusters to the centre of the Milky Way Galaxy with a distance of around 5,500 light-years. Its distance from Earth is 25,800 light-years. 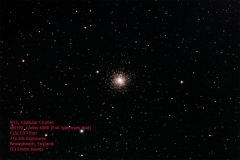 The total luminosity of this cluster is around 120,000 times that of the Sun, the absolute magnitude being -8.04. 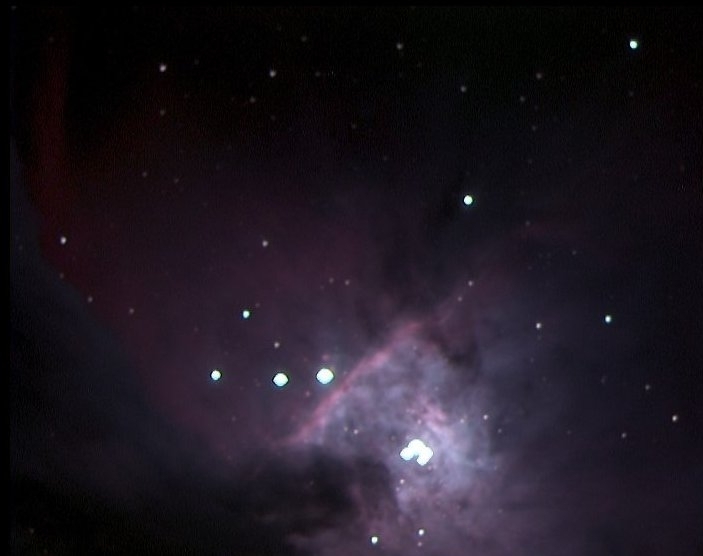 The Lagoon Nebula (also known as M8 and NGC 6523) is a giant interstellar cloud, classified as an emission nebula and H II region, in the constellation Sagittarius. 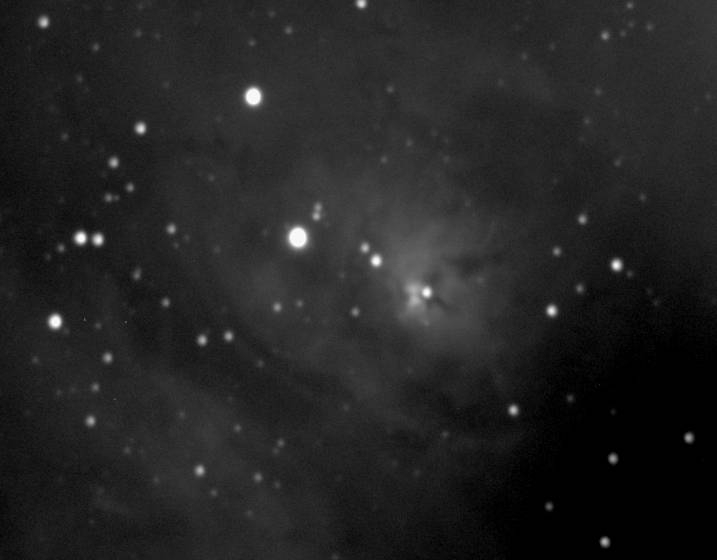 At an estimated distance of 4,100 light-years, the Lagoon is one of only two star-forming nebulae faintly visible to the naked eye from mid-northern latitudes. In binoculars, the Lagoon is a distinct oval cloudlike patch with a definite core, like a pale celestial flower. 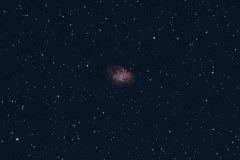 The nebula has a fragile star cluster superimposed on it, making this one of the leading celestial sights of summer night skies. 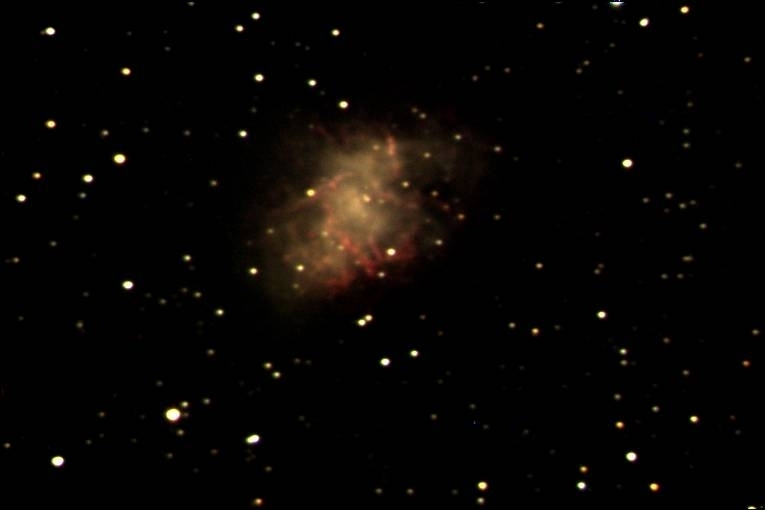 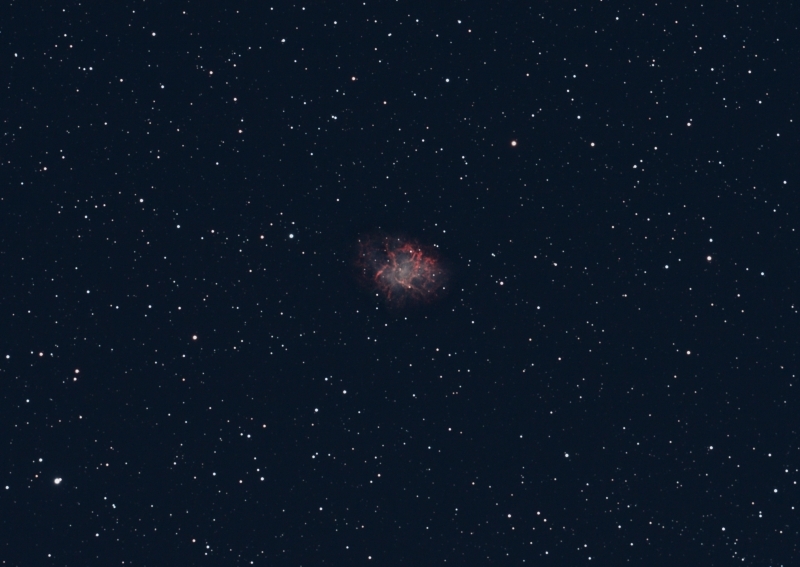 The Crab Nebula (catalogue designations M1, NGC 1952, Taurus A) is a supernova remnant and pulsar wind nebula in the constellation of Taurus. 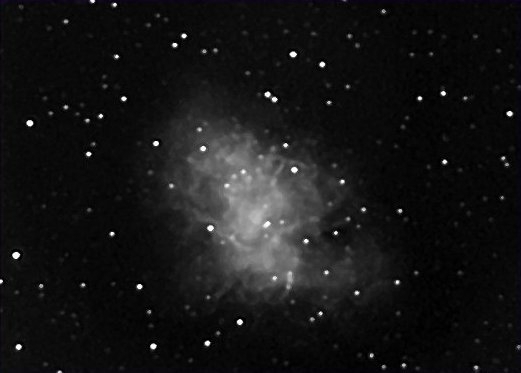 The nebula was first observed by John Bevis, and corresponds to a bright supernova recorded by Chinese and Arab astronomers in 1054. 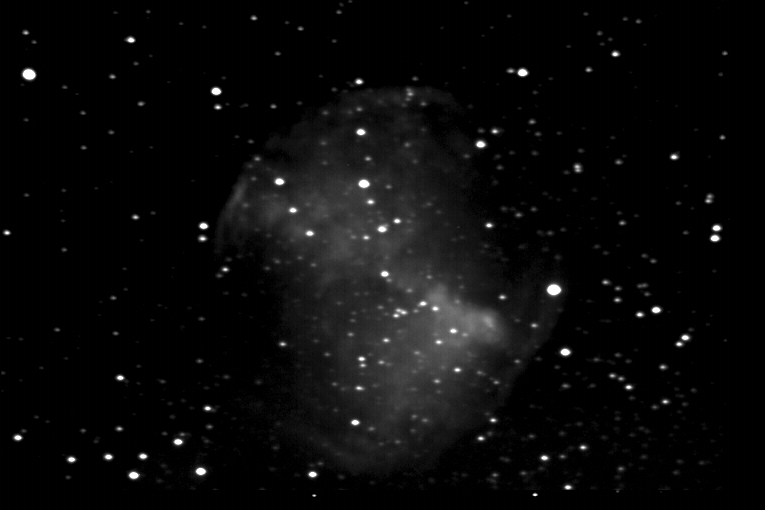 Located at a distance of about 6,500 light-years (2 kpc) from Earth, the nebula has a diameter of 11 ly (3.4 pc) and expands at a rate of about 1,500 kilometres per second. 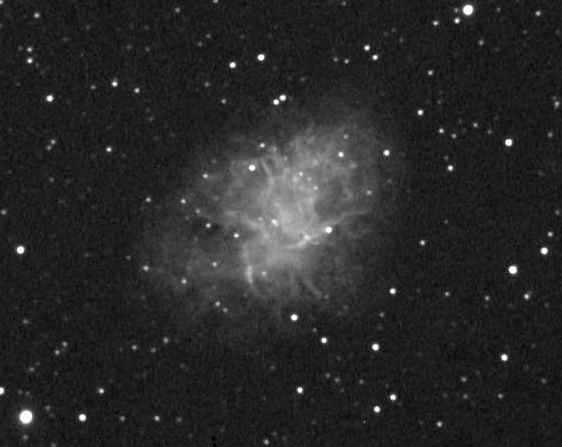 At the centre of the nebula lies the Crab Pulsar, a rotating neutron star, which emits pulses of radiation from gamma rays to radio waves with a spin rate of 30.2 times per second. 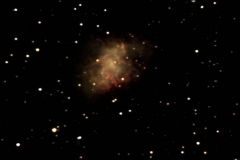 The nebula was the first astronomical object identified with a historical supernova explosion. 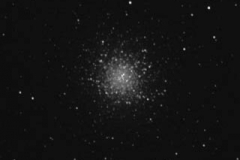 The Great Globular Cluster in Hercules (also known as M13, or NGC 6205) is a globular cluster in you guessed it the constellation of Hercules. It was discovered by Edmond Halley in 1714, and catalogued by Charles Messier on June 1, 1764. 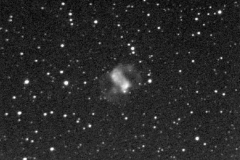 With an apparent magnitude of 5.8, it is barely visible with the naked eye on a very clear night from a dark site, (unlike the Crayford area). 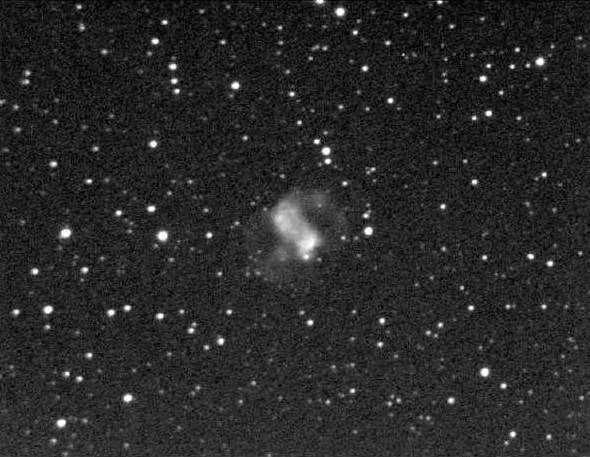 Its real diameter is about 145 light-years, and it is composed of several hundred thousand stars, the brightest of which is the variable star V11 with an apparent magnitude of 11.95. 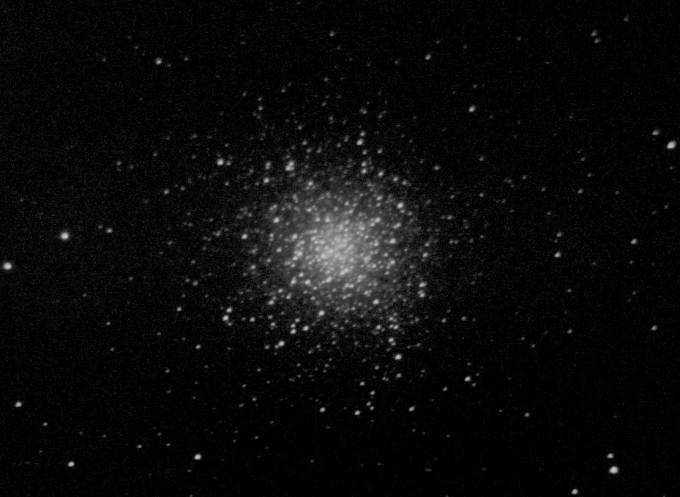 M13 is 25,100 light-years away from Earth. 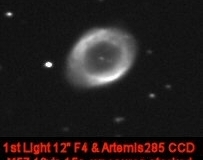 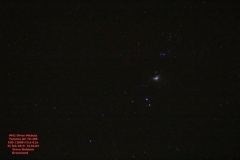 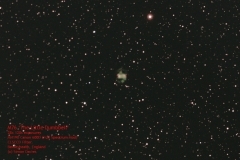 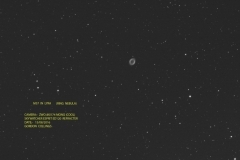 Its diameter is about 23 arc minutes and it is readily viewable in small telescopes. 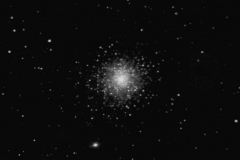 The Arecibo message of 1974 was transmitted toward this globular cluster. 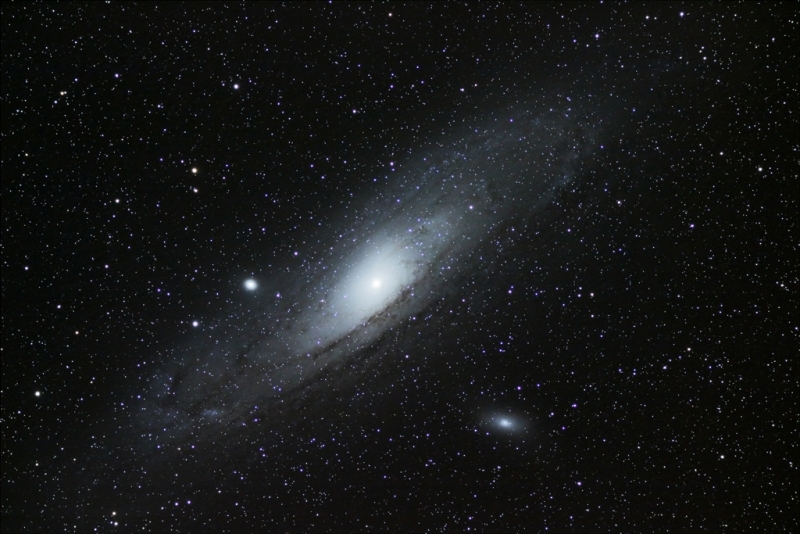 The reason was that with a higher star density the chances of a life harbouring planet, with intelligent life forms, were higher. 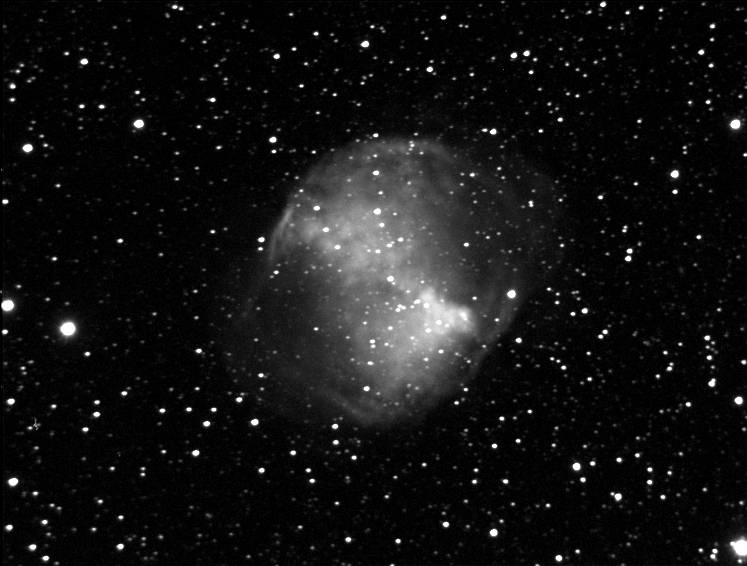 The Dumbbell Nebula (also known as Messier 27, M 27, or NGC 6853) is a planetary nebula in the constellation Vulpecula, at a distance of about 1360 light years. 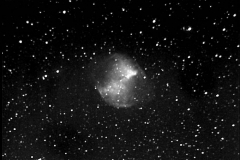 This object was the first planetary nebula to be discovered; by Charles Messier in 1764. 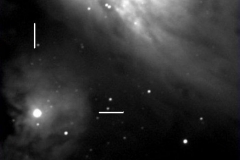 At a brightness of magnitude 7.5 and its diameter of about 8 arcminutes, it is easily visible in binoculars, and a popular observing target in amateur telescopes. 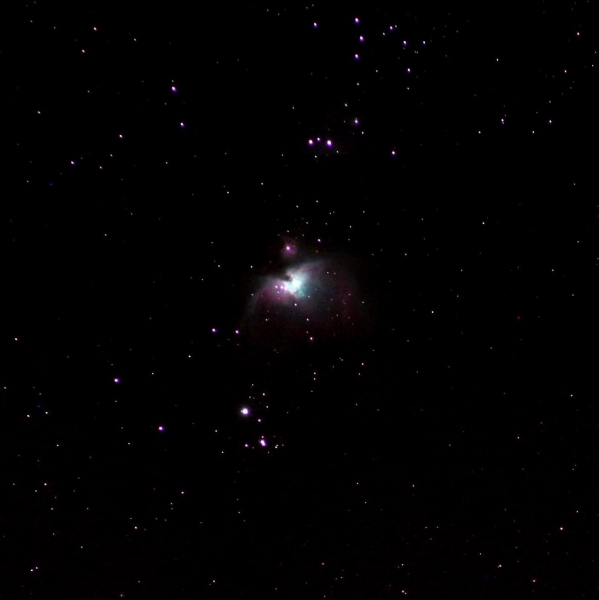 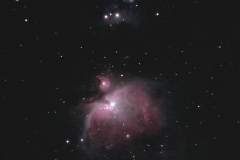 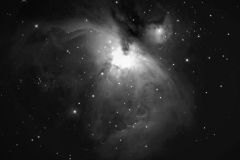 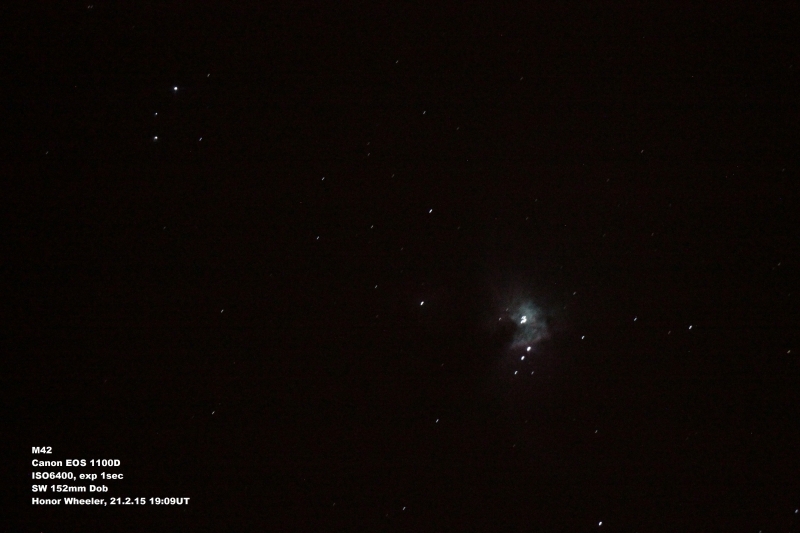 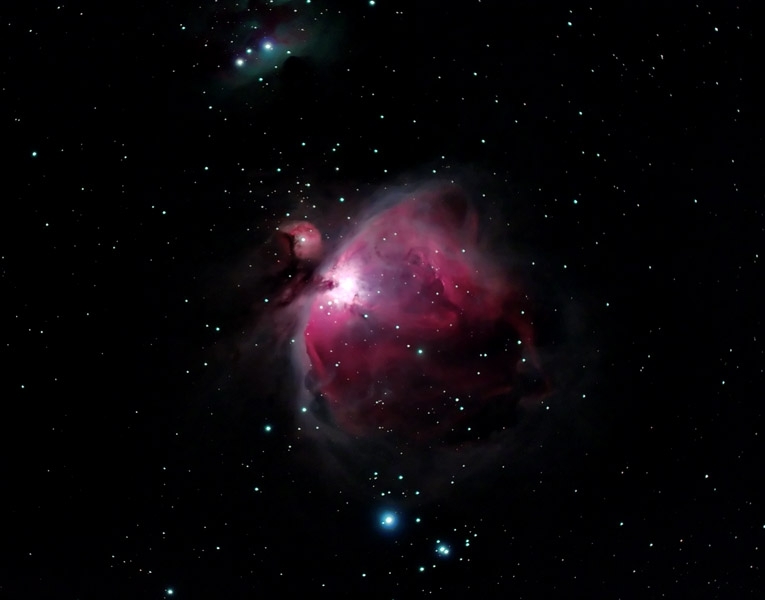 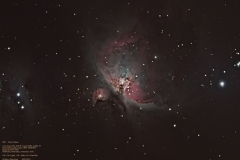 The Orion Nebula (also known as M42, or NGC 1976) is a diffuse nebula situated south of Orion’s Belt. It is one of the brightest nebulae, and is visible to the naked eye in the night sky – even on a good evening in Bexleyheath. 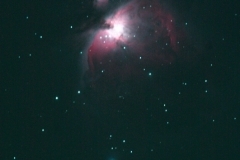 M42 is located at a distance of 1,270±76 light years and is the closest region of massive star formation to Earth. 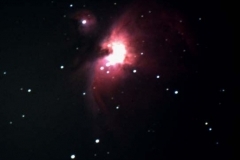 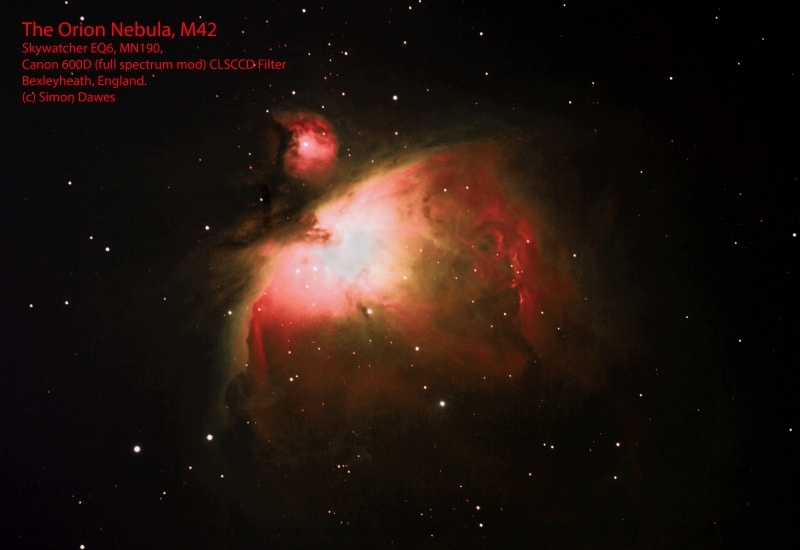 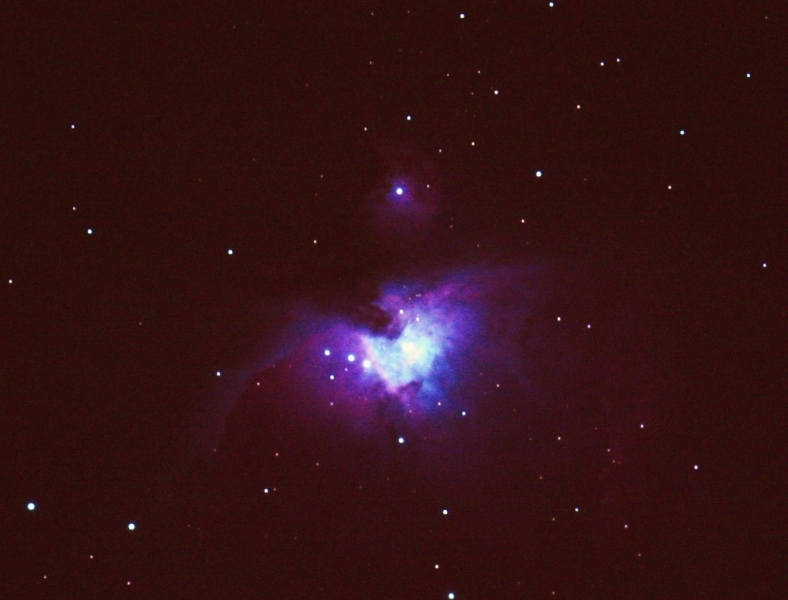 The M42 nebula is estimated to be 24 light years across. 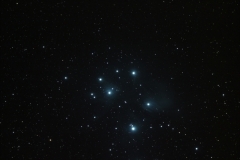 The Pleiades (M45) are an open star cluster in the constellation of Taurus. 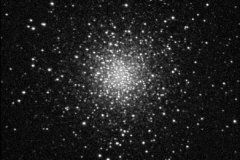 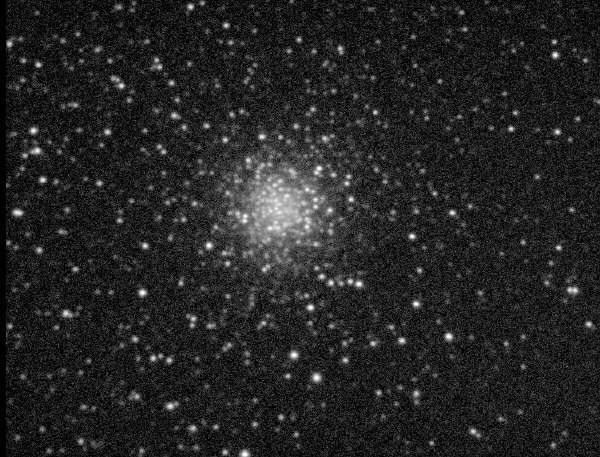 It is among the nearest star clusters. 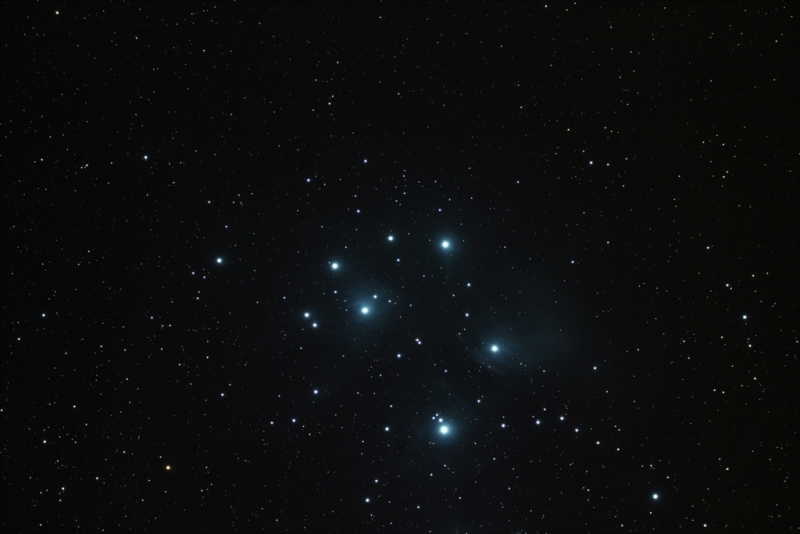 It is the cluster most obvious to the naked eye in the night sky. 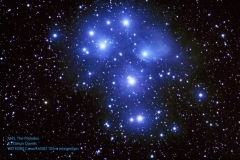 Pleiades has several meanings in different cultures and traditions. The cluster is dominated by hot blue stars that have formed within the last 100 million years. 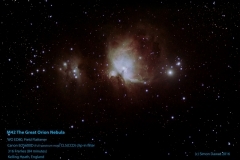 Dust that forms a faint reflection nebulosity around the brightest stars was thought at first to be left over from the formation of the cluster (hence the alternate name Maia Nebula after the star Maia), but is now known to be an unrelated dust cloud in the interstellar medium that the stars are currently passing through. 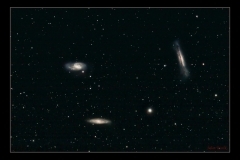 Astronomers estimate that the cluster will survive for about another 250 million years, after which it will disperse due to gravitational interactions with its galactic neighbourhood. 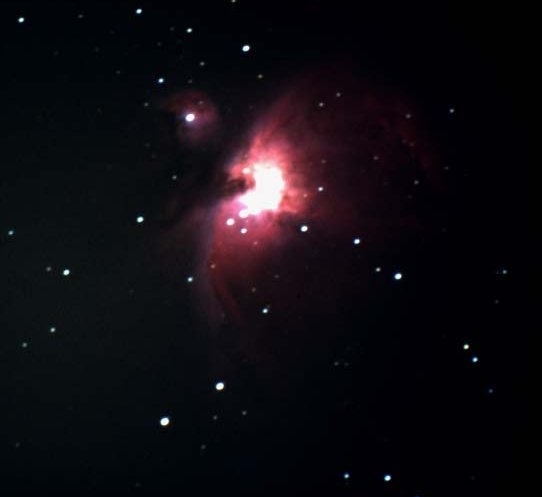 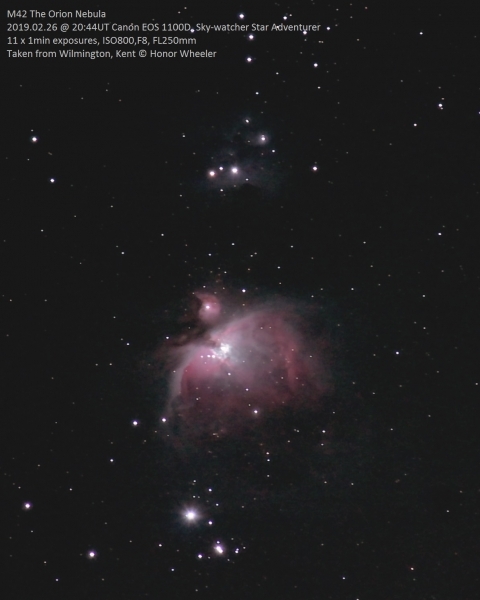 Equipment: Orion Optics VX10 scope, Skywatcher NEQ6 mount, Mono Atik 383L camera, QHY5 Guide Camera. 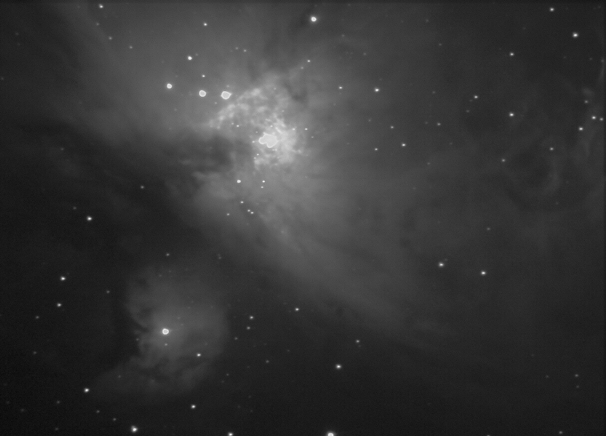 Frames:13 X 120s lights, no darks. 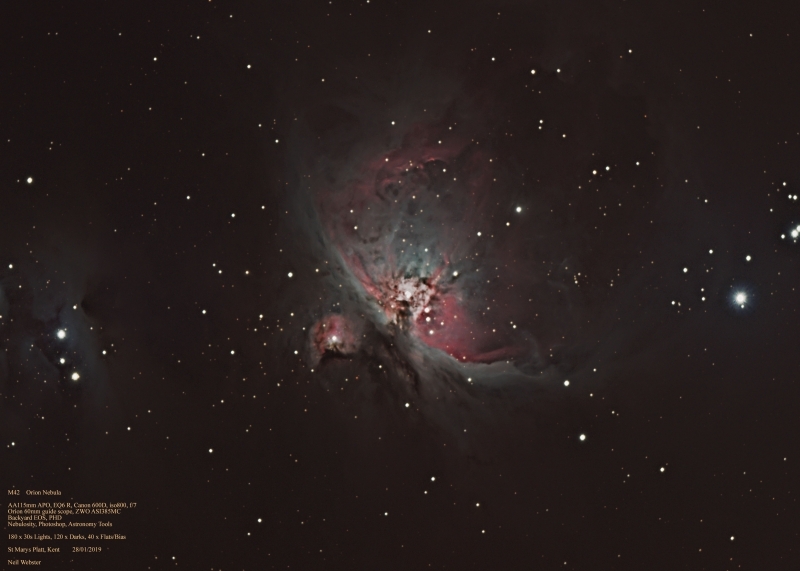 Processing: Stacked and processed in Astro Art. 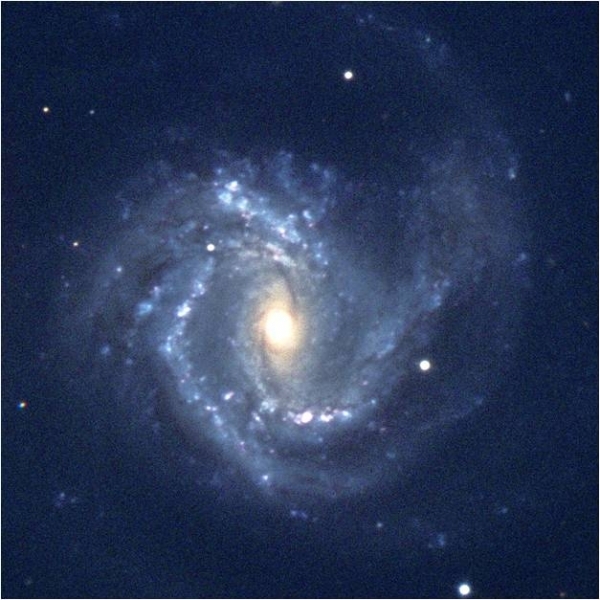 NGC 3628 is an unbarred spiral galaxy about 35 million light-years away in the constellation Leo. 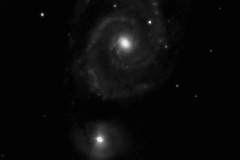 It was discovered by William Herschel in 1784. It has an approximately 300,000 light-years long tidal tail. 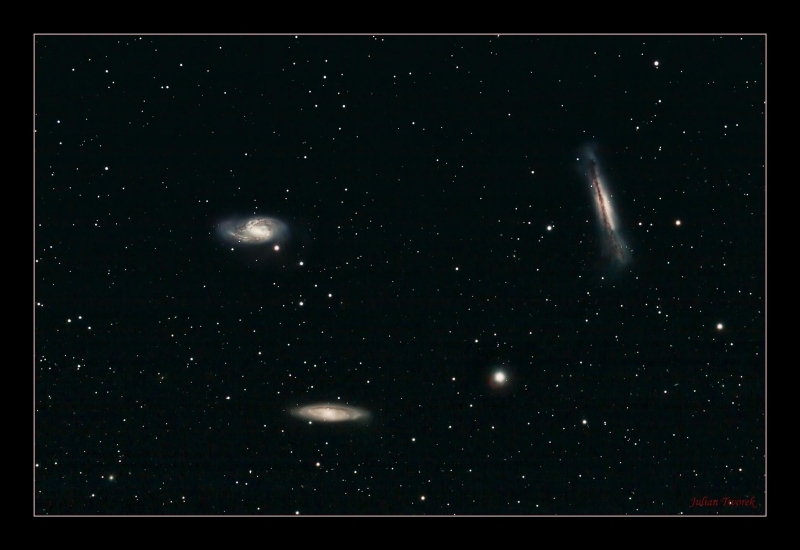 NGC 3628 along with M65 and M66 form the famous Leo Triplet, a small group of galaxies. Its most conspicuous feature is the broad and obscuring band of dust located along the outer edge of its spiral arms, effectively transecting the galaxy to our view.